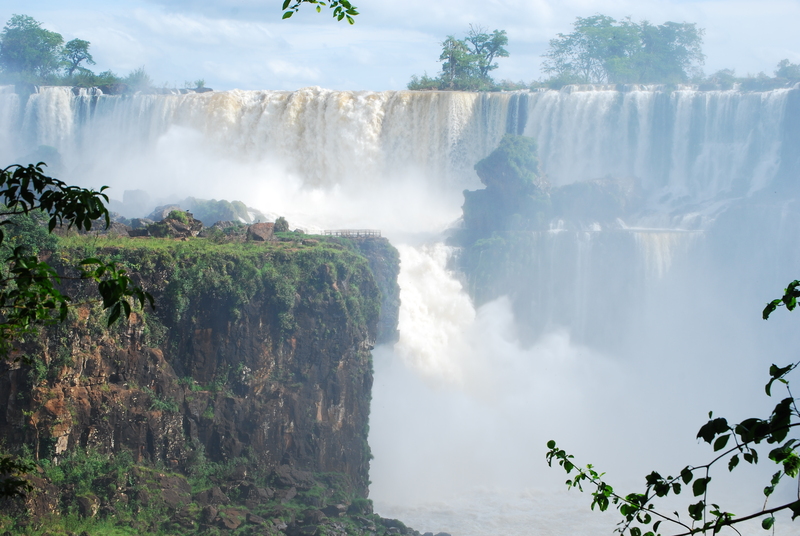 As of this month, you no longer need to pay $160 to Argentina just to visit if you’re a US Citizen. Previously, you had to pay a reciprocidad in order to get into the country–but no longer! Thanks to President Obama’s recent visit to Argentina, the US-Argentina relationship has thawed–resulting in $160 less for Americans to enjoy some quality asado, tango, y mate. 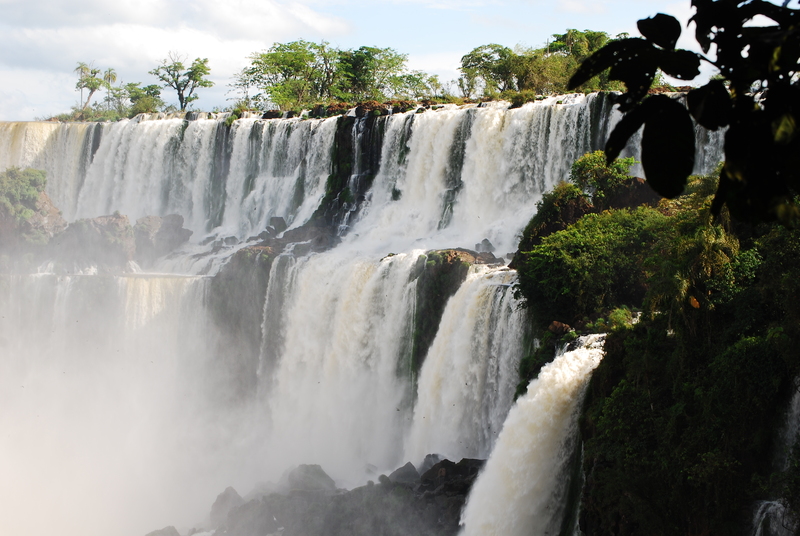 Effective 24 March 2016, the Argentine government has suspended the $160 reciprocity fee for U.S. passport holders traveling to Argentina for periods of less than 90 days for tourist or business purposes. For questions regarding the suspension of the reciprocity fee, please contact the Embassy of Argentina in the United States or Dirección Nacional de Migraciones in Argentina. Every day we see carpinchos (capybara) on our way to work. Carpincho is the Argentinian word for these hundred pound guinea pigs, whereas Capybara is actually the Brazilian Portuguese term. Traveling in herds of up to dozens of individuals, these semi-aquatic animals are some of the coolest things we get to see here. They’re surprisingly fast for a short, squat animal. We’ve stopped multiple times to try and just take a closer look at them, only to have them take off like a shot in the opposite direction. I was surprised to learn that carpinchos make a much different noise than guinea pigs. Like guinea pigs, they can make “clucking” and “purring noises” to indicate happiness, but carpinchos can also make almost birdlike “chirps” as well as some crying noises (almost like a bird crying) when they are in distress. They are incredibly social, and we’ll often see what we refer to as “daycares” in a certain hollow, where it’s all mothers and dozens of babies. It’s very cute. The other animal we get to see every once in a while are marsh deer. Notoriously shy, these animals (very similar to the North American mule deer) are categorized as vulnerable. Where we live, it’s illegal to hunt these deer at all–but it does happen. 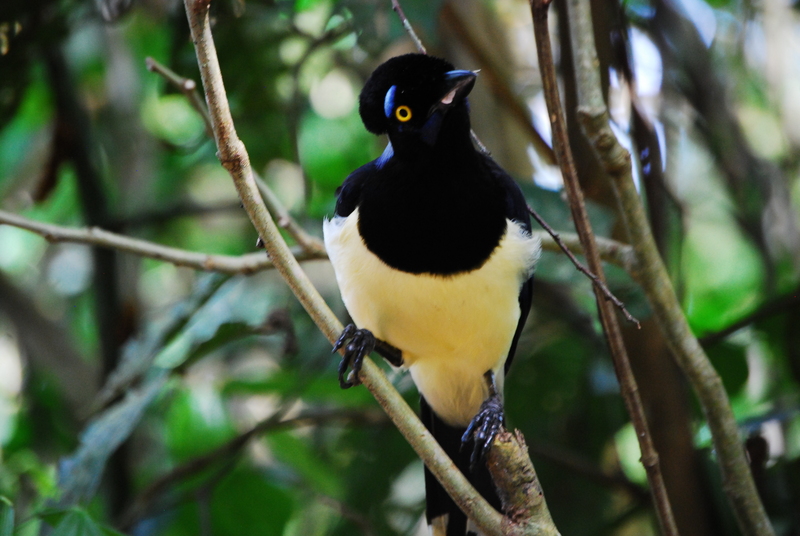 The area we live and work is has been the site of some particularly interesting environmental impacts, so Ituzaingo and the surrounding marshlands are considered a prime area for marsh deer breeding and reintroduction. We often see a solitary deer peeking out of the bushes sometimes in the mornings. We’re not sure if it’s the same deer every time, but it’s always a treat to spy him. When you think of Easter Island, what do you see? 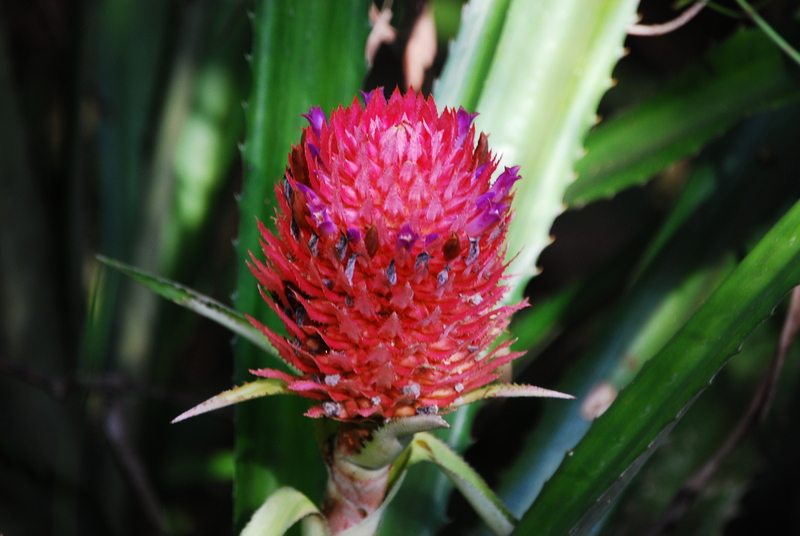 A trip to Easter Island is an exercise in appreciating everything around you. While you’re on the Island, you are literally on a UNESCO World Heritage Site. You’re seeing something that so few have had the chance to see, and it’s breathtaking. First things first–let’s get some basic vocabulary down. Moai are the famous stone statues. 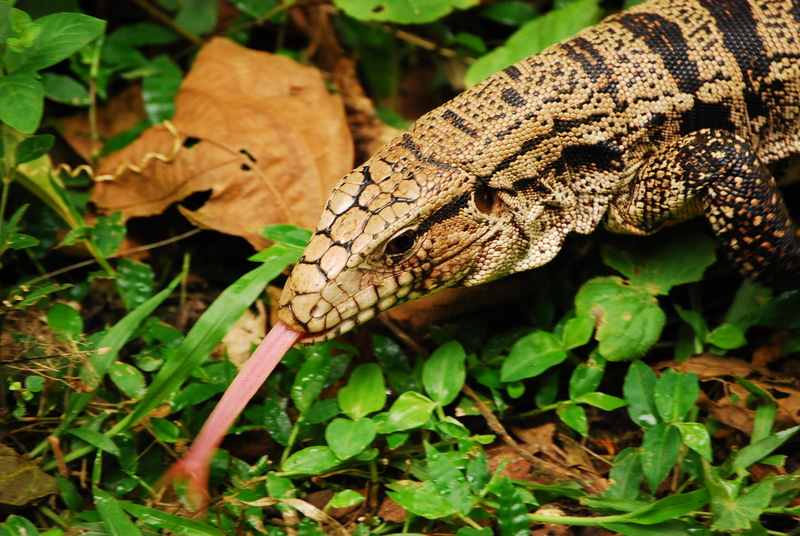 They’re not just heads–they are whole bodies (though often without legs). They were made in the image of important men in the various clans of the islands, and sit on burial platforms called ahu. The moai always faced inwards towards the island, and were said to inhabit the special spirits of the departed men they were fashioned after. They imbued the clan’s village with special luck and kept them safe from the rough seas, the blistering wind, and warring neighbor clans. So, they’re pretty amazing artifacts. But, after three days of seeing nothing but stone heads, it’s easy to get Moai overload. We had started to have this happen… and then we visited Rano Raraku. Essentially a Moai Factory, Rano Raraku is where all of the Moai on the island were made. Hewn from the volcanic rocks, the moai here were carefully made into the likenesses of important men in each of the island’s clans, and painstakingly transported miles across the island to their final resting spots. Where else in the world will you see hundreds of moai in various stages of construction littering the side of a volcano? This is why Rano Raraku is often the site of some of Easter Island’s most iconic images. Even after seeing dozens of other moai, it’s mindboggling to play “find the moai” in the rocks. The largest was 71 meters tall, and was still in the midst of construction when it was finished. Being able to look down from the top of the path and see the moai “moving” in their paths toward the ahus is a chance to reflect on how much work it really took to move these several-ton objects around a rocky, often difficult island landscape. There’s one moai that is definitely not like the others. Tukuturi is the only maoi that has legs. Made from an entirely different stone than the other moai on the site, it stands out to show how different moai could be. Allegedly, this was one of the last moai to ever be made, and reflects the position taken by those who served in ceremonial choirs on the island. We finally made it to Carnaval! Somehow, we had missed going to this South American rite of passage our first year here, and budget cuts in town meant last year’s Carnaval was cancelled. However, they were back in action this year–so we figured we’d brave the incredibly hot and muggy weather and see what makes this so special. We just went to Ituzaingo’s small-town Carnaval–but it was still pretty impressive. I think some day we’d like to see a big-city Carnaval, but we just didn’t have the energy or time to devote to getting to any of the cities nearby. But being able to walk four blocks from the house and see a whole Carnaval parade is pretty special unto itself! Carnaval in Argentina was officially two days (February 8th and 9th), but in addition to these federal holidays, Ituzaingo added three more weekends in January to the mix to maximize their tourists. 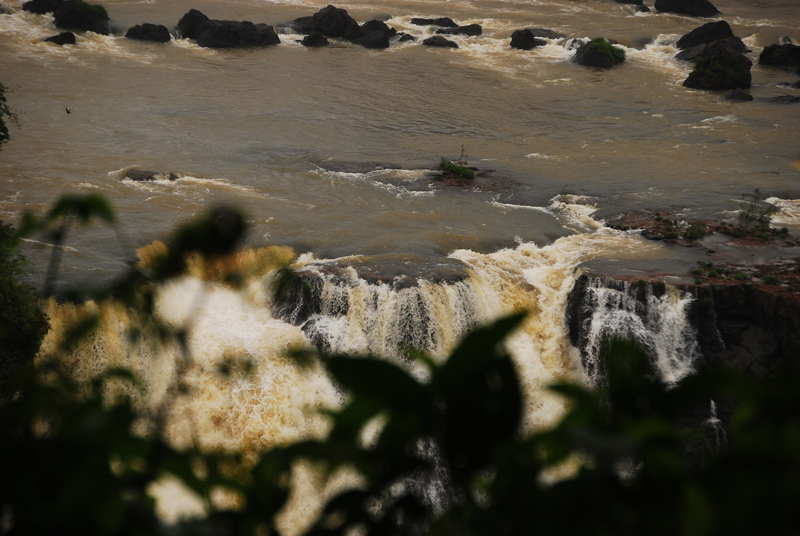 The town could very obviously use the tourism–major flooding over the Christmas holiday wiped out almost all of the town’s beaches, so the tourists aren’t coming in droves from Brazil as in years past. From a logistics standpoint, Carnaval shuts down about a mile stretch of the main road into town. The elaborate floats end up being parked in an open-air garage that’s only about two blocks from our house–so we had the interesting opportunity to check out the floats in daylight before we saw them in action at Carnaval. Carnaval starts LATE. The first round doesn’t start until about 11pm. We chose to do general entry, which was 30 pesos (or somewhere around $2USD) and allowed us standing room only. We figured this would give us the best option to walk from one end to the other and get the best vantage points for photos. They had the option of sitting on the bleachers (60 pesos) or in the “fancy seats”–otherwise known as lawn chairs on the dais (100 pesos). We knew that Carnaval would be full of barely-clothed women decked out in sequins, but I didn’t anticipate how inclusive it would be. People of every age, from toddlers to older folks, participated in the parade. It really was a community effort. As estadounidenses, we were a little uncomfortable with the preteen girls in g-strings–but it wasn’t particularly surprising, considering that’s pretty much what the bathing suits are down here as well. The costumes were incredibly ornate, and everyone was sprayed with copious amounts of glitter spray. Considering how difficult it can be to get so many basic craft goods in rural Argentina, I can’t imagine how much effort had to be put not just into making the costumes, but just in getting the raw materials! Each group started with a fanfare and flag bearers to clear the way. That’s followed by various groups, each with their own costuming theme. It seemed like some of the songs had a specific dance the whole troupe would do and others allowed each group to create their own choreography. The costumes would get wilder the closer to the end, and was often closed out with an elaborate float carrying that company’s “Carnaval Queen(s),” followed by the Argentinian version of a marching band. We ultimately only stayed until 2am (about three “crews”)–but we were told the party went on until after 7am. After further consultation with our Argentinian friends, it seems like the traditional schedule is to go out to eat at 9 or 10pm, drink a little bit at the bar, and then go to Carnaval for a bit, and finish the night (morning?) by dancing at the club. Overall, I’m glad we got to experience Carnaval! The best way I’ve found to describe how the various groups work is that it’s very much like the Mummers in Philadelphia. The groups are familial or neighborhood based, and they spend a whole year coming up with a theme, costuming, choreography, and music. Each crew has their own distinct flavor, but they are all impressive in their own right. It was a great night to see the whole community to come together and dance, sing, and (of course) spray foam. Don’t know what these are? I actually bet you do. Known in the US as Toms, these canvas slip on shoes with rubber soles are incredibly common footwear in Argentina. You can find them in every store (even the grocery store), and they are significantly cheaper than their $60 per pair US cousins. Stock up on the fun patterns and colors. Is there anything more Argentinian than mate? I think not. 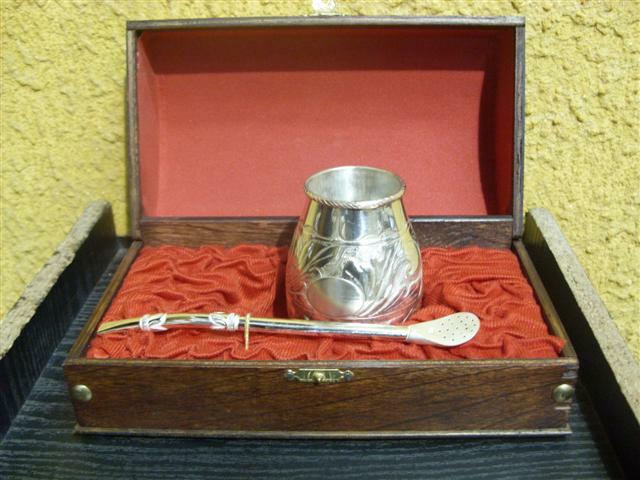 Take away an Argentinian’s mate cup, and it’s like you took away his left arm. Needless to say, with mate being so ubiquitous, there are thousands of mate designs and materials. Mates can be gourds, wooden, ceramic–the ingenuity given to this simple item boggles the mind. I’ve even seen some extremely high end ones made of sterling silver. Just be careful about bringing yerba mate back to the US–it looks suspiciously like marijuana to US customs. You can buy yerba mate Stateside in more hippie-dippie grocery stores like Whole Foods, and it’s also available on Amazon (as all things are…). Even if you don’t like the taste of mate, having the actual mate kit is a fun souvenir that really is the most Argentinian thing ever. At all of the tourist traps and in all the airport shops, you’ll see all sorts of little statues, beads, and jewelry made of precious stones. 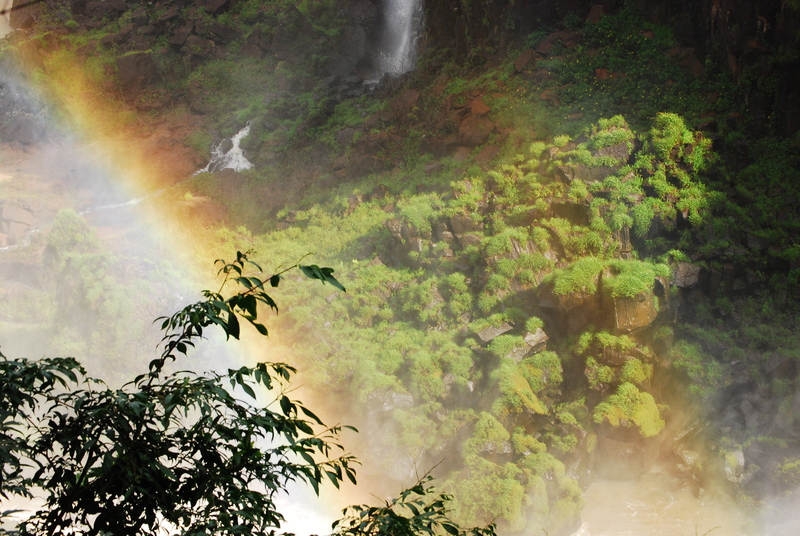 Argentina is full of beautiful gems (see: Wanda Mines near Iguazu). A lot of it can get touristy very quickly–but some of the pieces are beautiful! Generally reasonable prices, particularly outside of the heavily touristy areas. 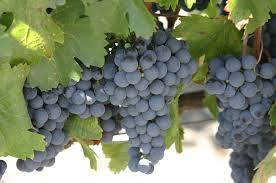 Argentina is the land of Malbec. Beautiful, delicious malbec. It’s easy to grab a great bottle of wine at the grocery store for less than $10USD–so save some room in your luggage or home goods shipment for some bottles. Just be ready to pack them up nicely–I like these wine bags. 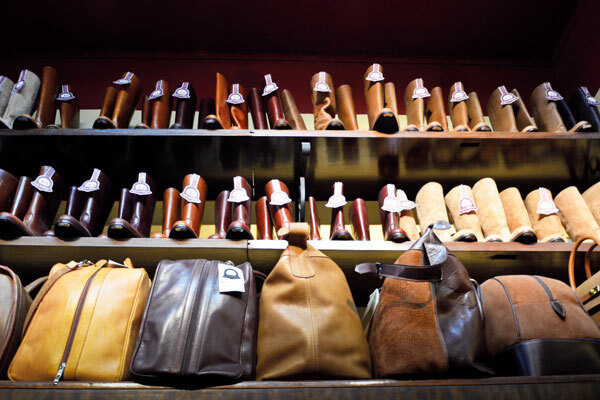 From purses to belts to shoes to jackets–leather is king, and it is good quality and cheap. There are some really inventive and high quality leather goods to be found in Argentina. I’ve found it best to not just frequent the stores on Avenida Florida, but instead to branch out to more of the boutique places to find some really good deals on really interesting pieces. If you’re looking for a good brand name, try Prune. They’re based in almost every city in Argentina, and make very good quality. Also, their stores make you feel incredibly fancy–they’re set up like very high end boutiques in the US, and often their associated speak at least a bit of English to help the confused tourist. This one only applies if you’ll be here for a while, but if you’re going full on expat and you have a kitchen, take advantage of the incredibly low meat prices (especially high quality, grass-fed beef). That random braising method you were nervous to try with pricey US meat? Do it here! Do you have a home in that age range? Get thee to San Telmo! We found lots of neat hardware (doorknobs, drawer pulls, fixtures) from this time frame–and for reasonably cheap. Those years were Argentina’s hey-day, when the world saw Buenos Aires as one of the richest and most luxurious cities in the world. (Harrod’s even had their ONLY other store in Buenos Aires! It’s now shut down since the 2001 economic crisis, but the building still stands with the original sign on Avenida Florida.) Stock up on some of these awesome little items–not just souvenirs, but really practical as well! I’m sure we’ll think of other good things to pick up in Argentina and I’ll have to do a part two! 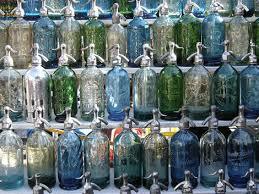 The country is full of exciting street fairs and flea markets–with lots of inventive craftspeople showing their wares. 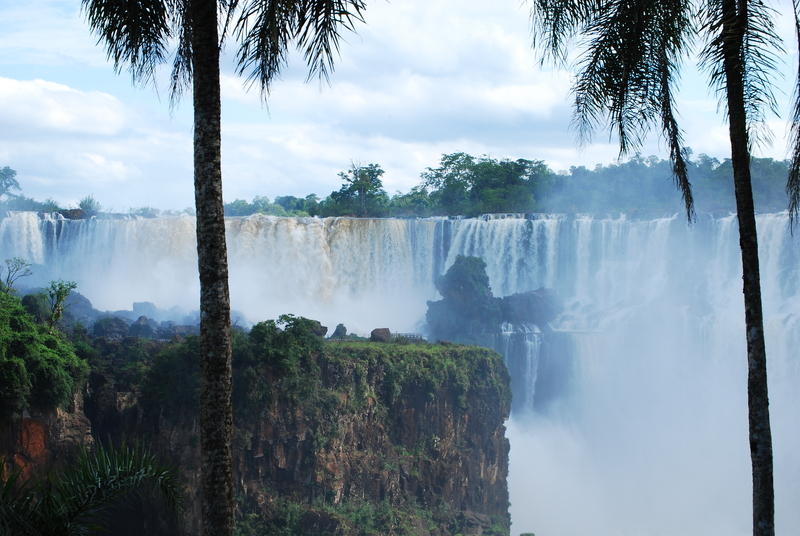 We knew that a trip to the Falls wasn’t complete until you had seen it from both sides (Argentina AND Brazil). However, being US citizens, we needed a visa to get into Brazil. 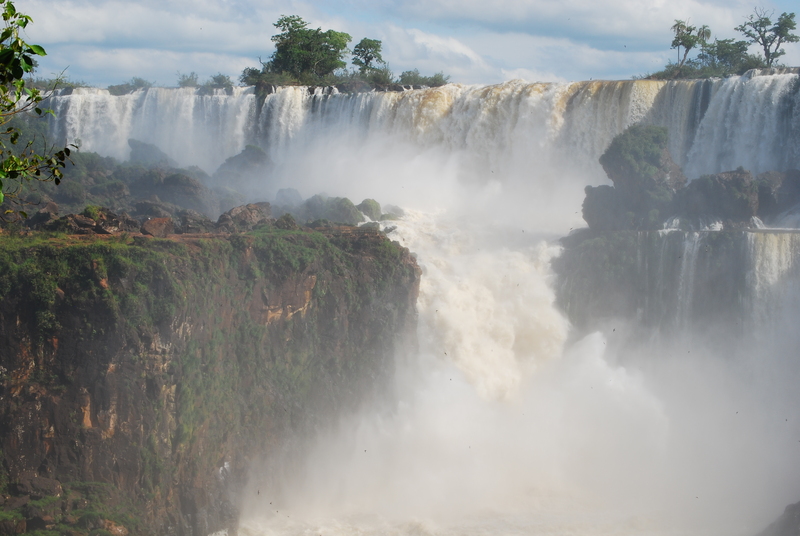 Thankfully, Puerto Iguazu in Argentina has a Brazilian consulate that grants quick visas. Since the process is ever-changing (hello, South American official paperwork) and the information in the internet is slim, here’s our process. 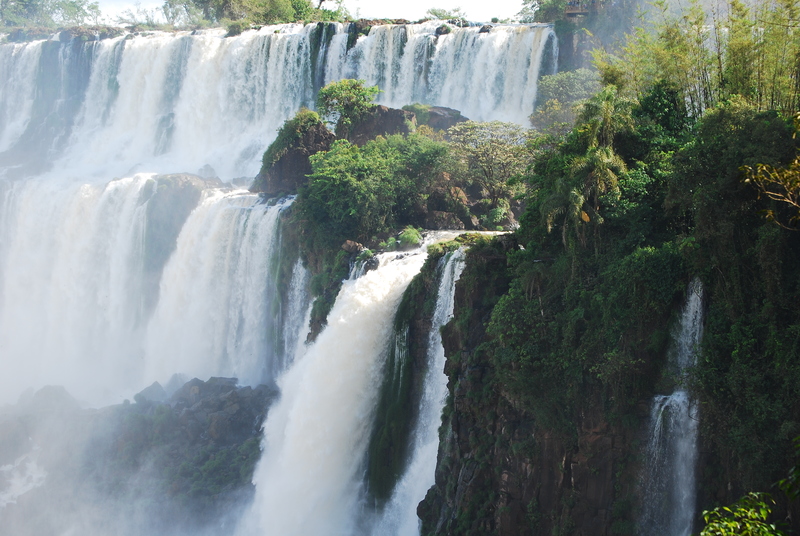 Fill out your Brazilian visa form online here, print out the form (and make sure you save a copy of your confirmation number! ), and attach your approved passport photo. Remember–no smiling, needs to be a white background, and adhere strictly to the size limits. The online form is experimenting with uploading some documents, but it’s still in beta stage, and assume you’ll still need to bring your documents and paperwork with you. Also, when they ask for your hotel information in Brazil, we just chose a random hotel. They never checked to see if we actually had a reservation, and I assume most people coming through are day trippers. If you’re a temporary resident of Argentina: all of the above, PLUS a copy of your DNI (front and back), a copy of your residencia temporaria legal papers, and we brought along our precarias just to be safe. 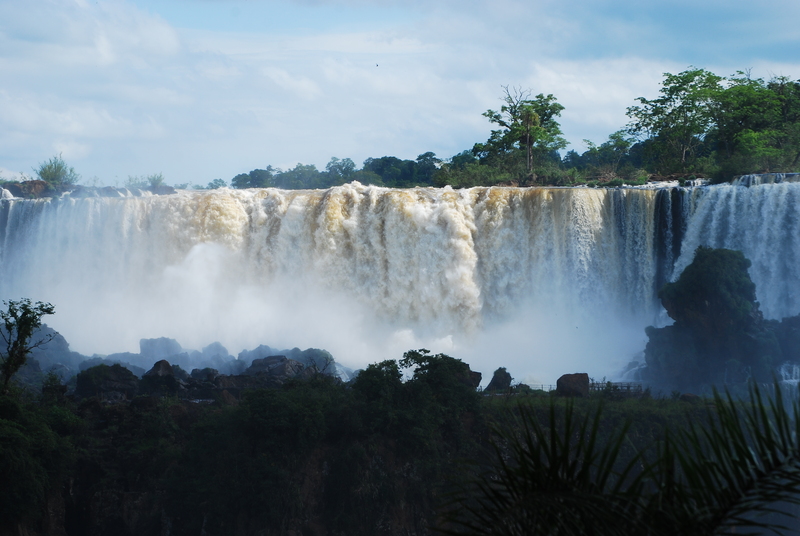 Also note, Argentine temporary residents–if you have your own car in Argentina, make sure with your car insurance company that it has the optional “MERCOSUR” insurance that allows it into Brazil. That is one thing that the Argentinian aduana was diligent in checking. You can pay your fee, which is somewhere around the line of $160USD, in either pesos (subject to Brazil’s current feeling on what a peso is worth) or in reais. We paid in pesos and had absolutely no problem. Just be sure to have exact change (or as close as you can be. I think a 5 is okay if you have a bill that’s 32, but they won’t exchange 100 peso notes. If you need it, there’s a Macro bank in the city center of Puerto Iguazu, about four blocks away from the consulate, that has four clean, well-maintained ATMs. As usual in Argentina, stock in said ATMs will probably be lower around the 1st and 15th of every month as people get their government payouts on their EBTs. So plan accordingly. So, we submitted all of our paperwork, paid all of our money, and left our passports with the nice Brazilians overnight and picked it up the next day. And, honestly? 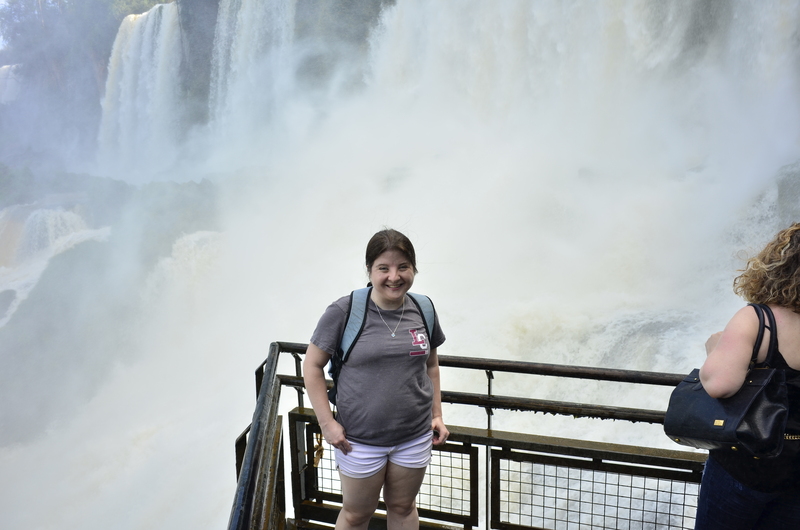 Although I had heard some stories about how the Brazilian consulate can be a madhouse of backpackers, tourists, and generally Americans behaving badly on a Friday–we were the only ones there besides the consulate employees. It was a pleasant experience, and not much of a hassle. We have our own car down here in Argentina, and we double checked to make sure it has the optional MERCOSUR insurance upgrade that allows it to drive into any MERCOSUR country without a problem. 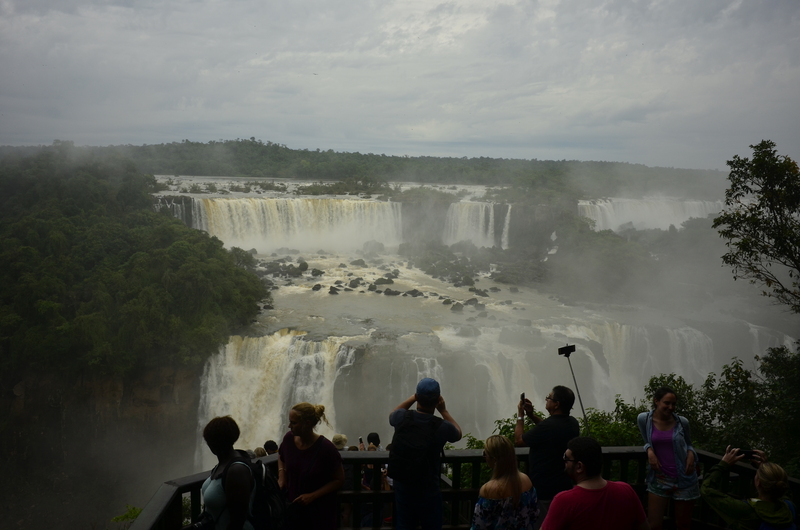 There are plenty of buses in Puerto Iguazu that go to the falls everyday, and even more travel companies happy to take your money in exchange for a ride and a tour of the Brazilian side. 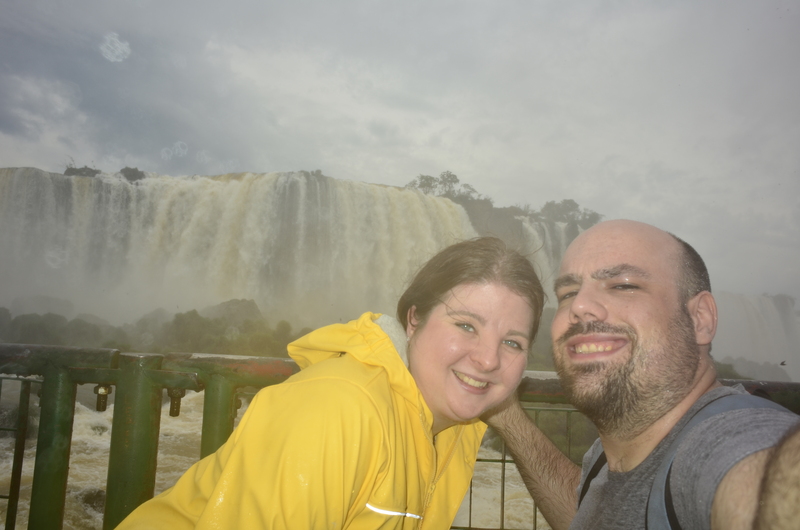 We easily drove through customs (although we always get funny looks when the customs agent sees “EXTRANJERO” or foreigner printed on our national ID cards) and made it into Brazil. Here’s where I talk about the seedy portion of all of this. 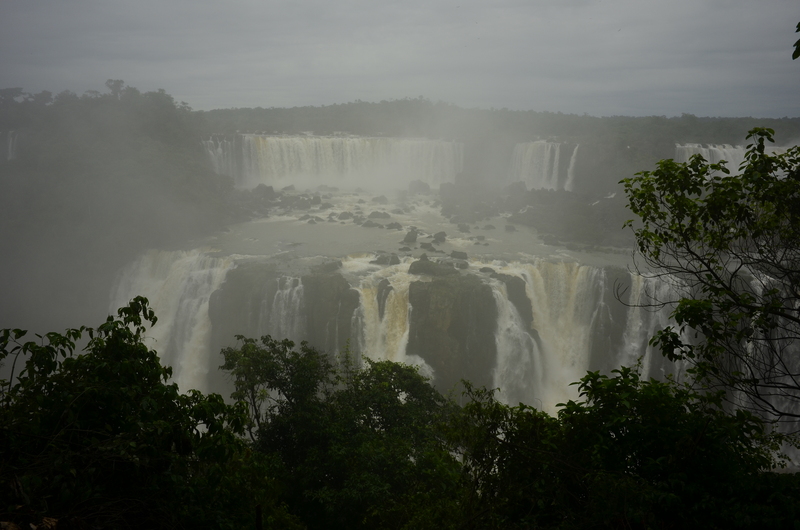 The border between Argentina and Brazil at Iguazu/Iguacu is not terribly well patrolled for bus patrons. 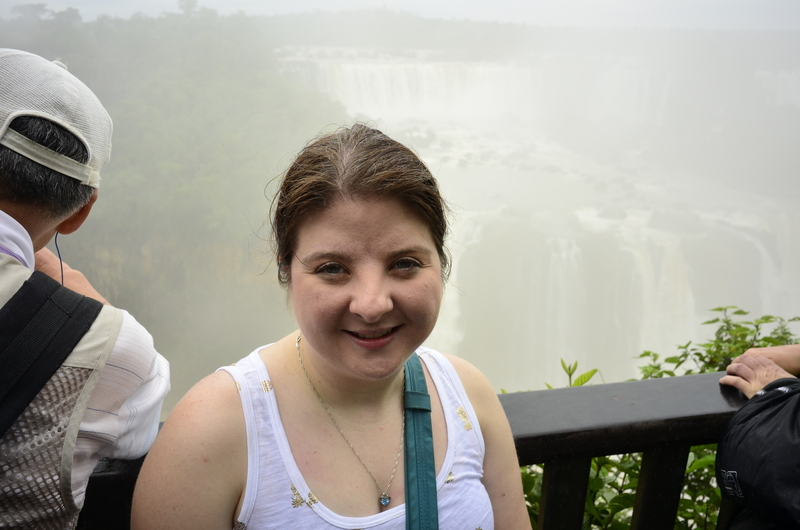 We’ve been told several times that it is absolutely easy for people to just ride a bus and go over to the other side without getting a visa, and without legally exiting/entering either Brazil or Argentina. 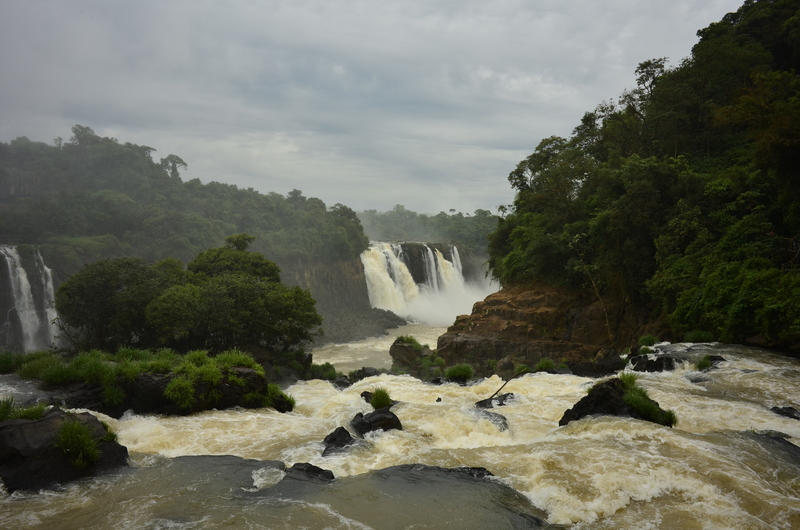 Because we work down here, and we’d prefer to not have to call our employer for them to bail us out of the customs pokey, we chose to go the legal route, and thus, I have no comments about the whole “sneaking across the border” part of Iguazu. 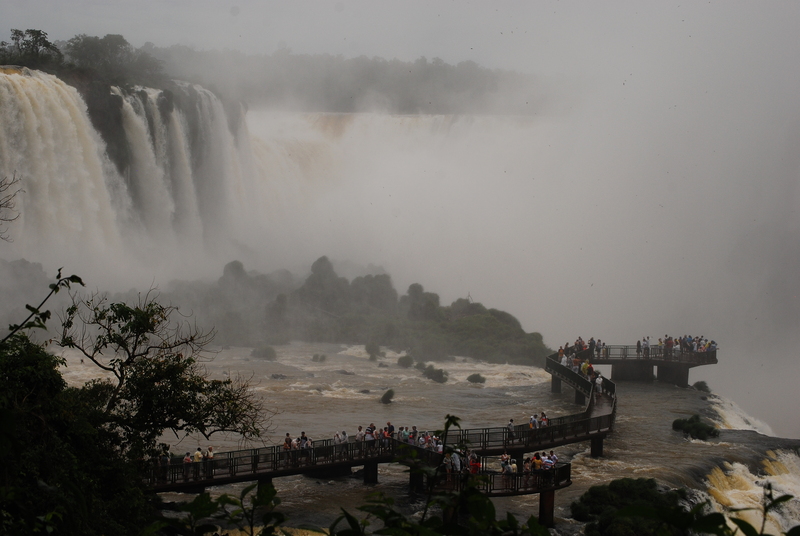 In many ways, Foz de Iguacu is like Puerto Iguacu–all about the tourists. Shops and people selling their wares on the side of the road. And as always, poverty–the likes of which probably shocks those from the First World, but is sadly part of our landscape now. 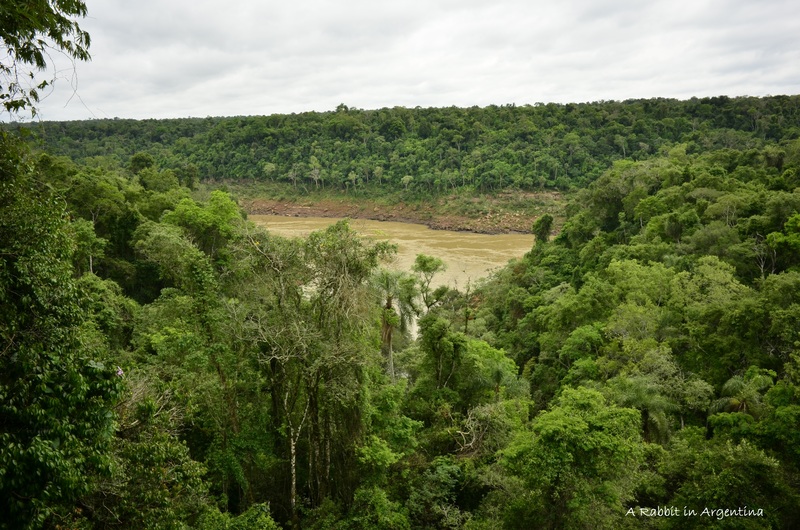 However, in many ways, the Brazilian side is radically different. Brazil has a much more open economy than Argentina. As a result, there are many more imported products–the motorcycles are Harleys and Hyabusas as opposed to bicycles that someone attached a lawnmower engine to. There’s Hershey’s chocolate and clothes from China. (In Argentina, one of the more draconian rules is that it’s incredibly difficult and expensive to import clothing for sale. As a result, easily 95% of the clothes are made in Argentina, with the exception of a few giants like Nike, Reebok, and LaCoste.) Everything just looks a little bit nicer, a little bit more commercial… a little bit more American. 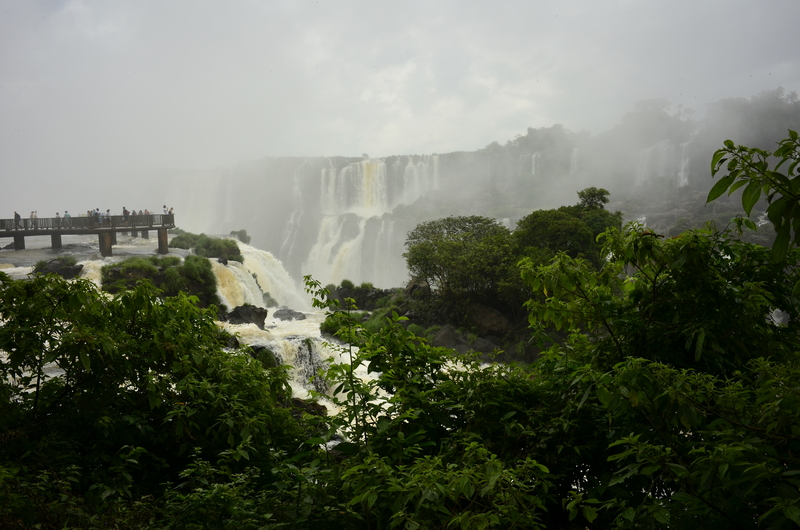 Whereas Puerto Iguazu feels exactly like an Argentinian/South American tourist town without any recognizable fast food brands or chains, Foz de Iguacu felt more like South America’s Myrtle Beach… with waterfalls! 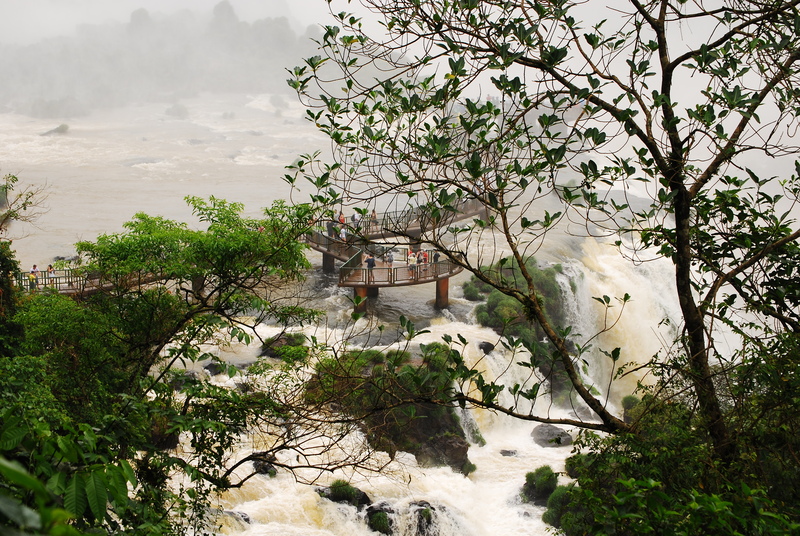 This feel extended to the Foz de Iguacu park itself. 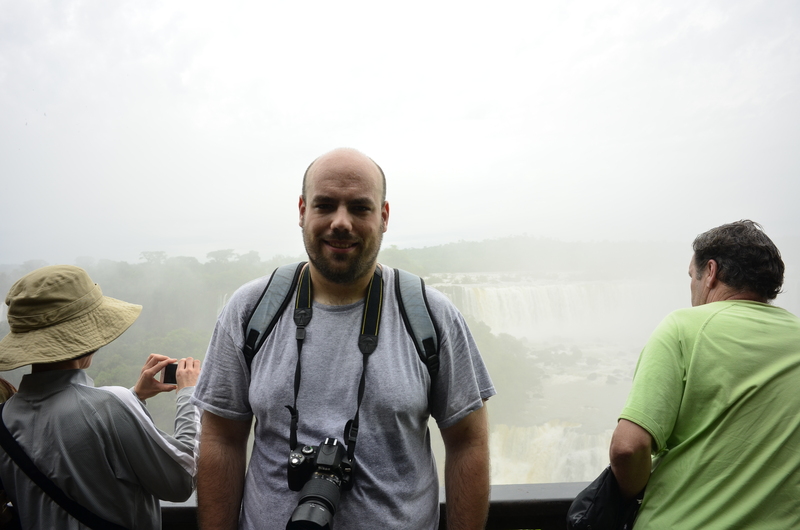 With a modern parking lot (paved versus Argentina’s dirt), the ability to pay with a credit card (versus Argentina’s cash-only policy), and modern buses taking tourists from the fancy queues and gift shops to the actual falls (versus a train in Argentina… or a hike), it just felt more like an American Six Flags safari than Argentina’s side did. This is both good and bad. We loved the efficiency of just paying for parking when you bought your ticket, being able to easily use your credit card, clean public bathrooms, and obviously announcements in English, Spanish, and Portuguese. 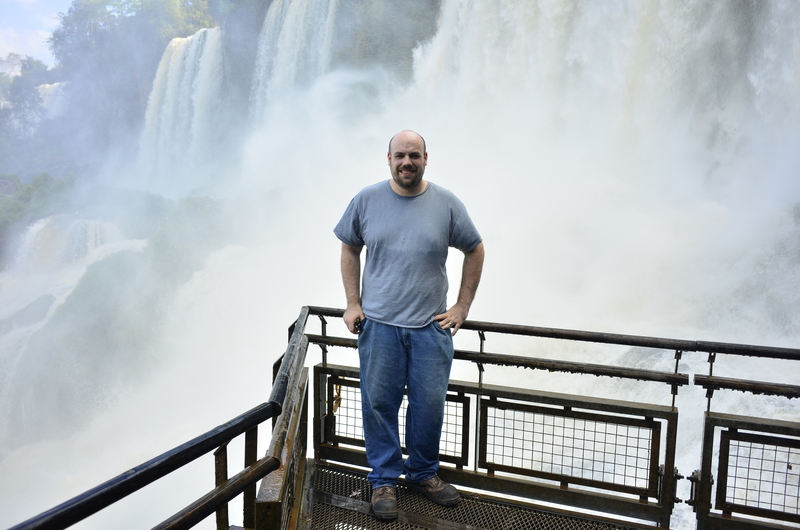 But it definitely felt less like a great South American adventure… and more like any other trip to an American tourist attraction. 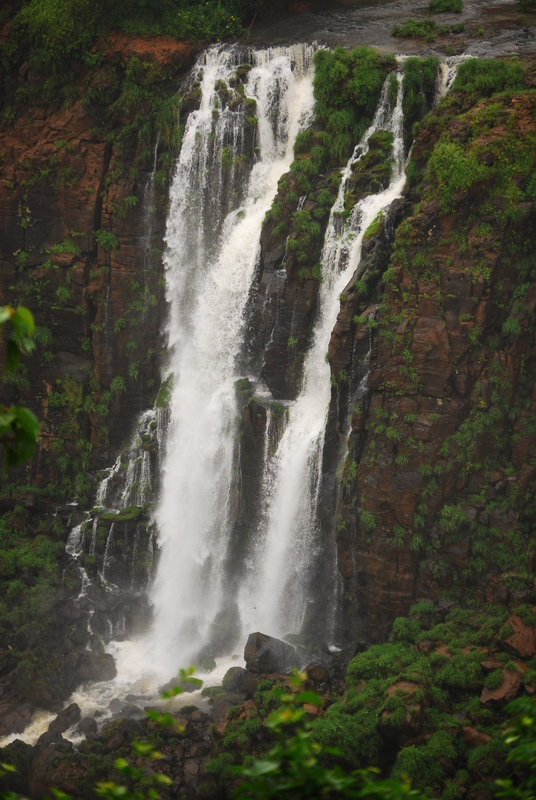 However–the falls were beautiful! 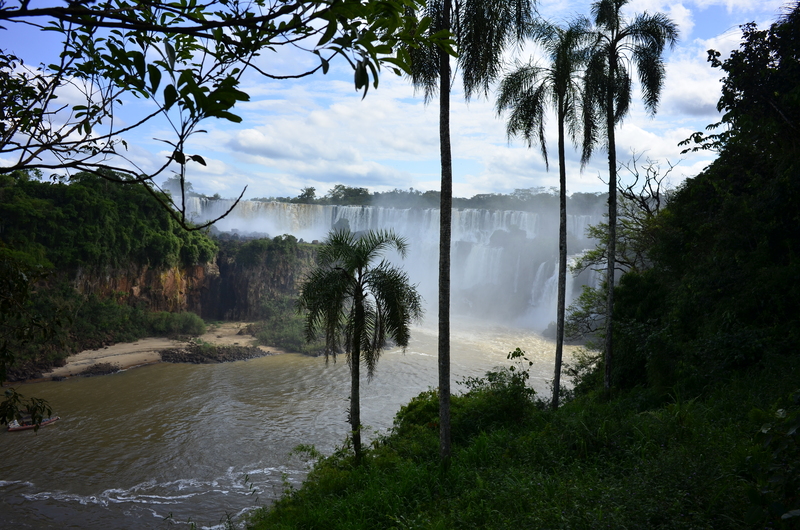 Whereas the Argentinian side lets you get up close and personal with the falls, the Brazilian side offers some great panoramic views. 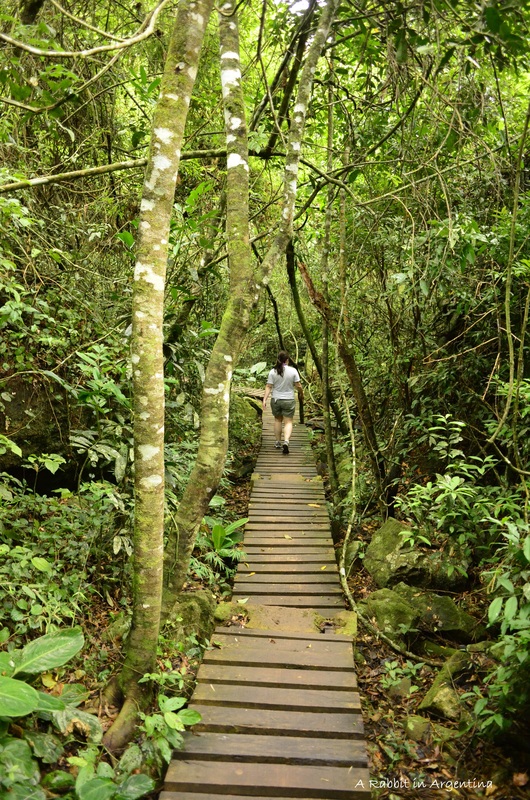 A concrete pathway winds along the side of the cliff–be careful, it’s much more crowded on the Brazilian side than we ever encountered in Argentina! 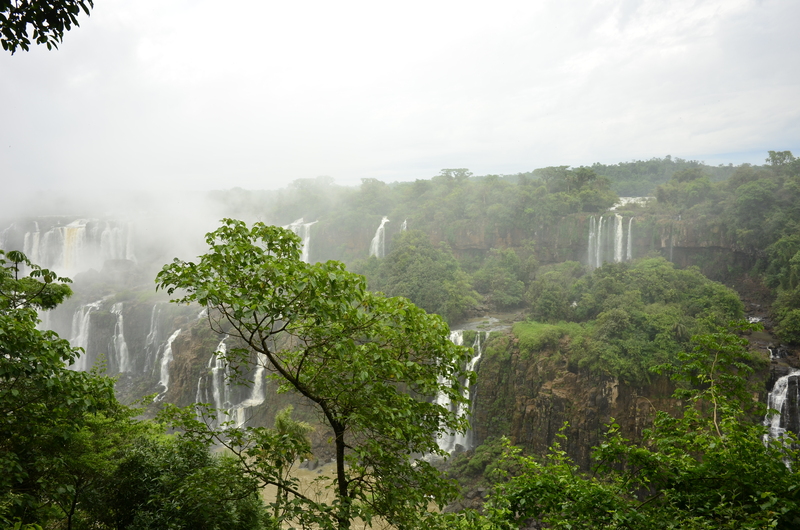 But, you get some gorgeous photos of the Falls in their full glory–and they have a great concrete walkway that leads right into the mist of some of the falls–great for photo opportunities! 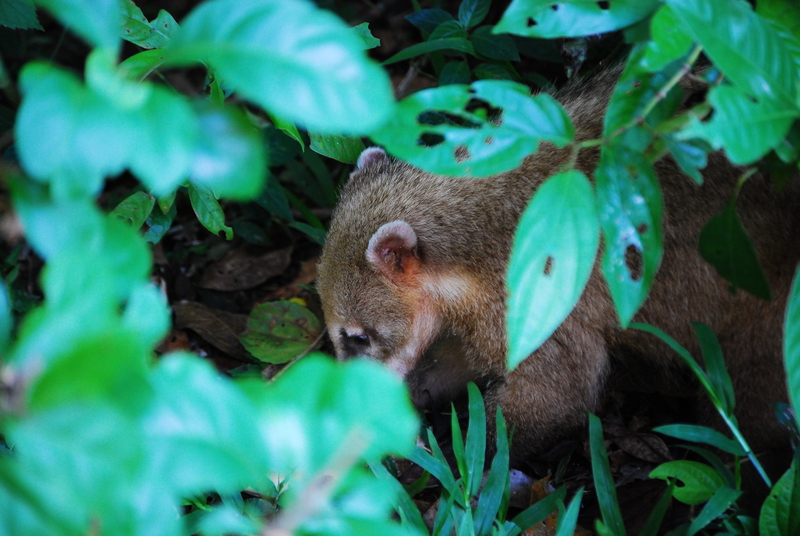 We grabbed lots of great photos, and saw even more coati trying to steal food from the tourists, but ultimately didn’t spend as much time on the Brazilian side. 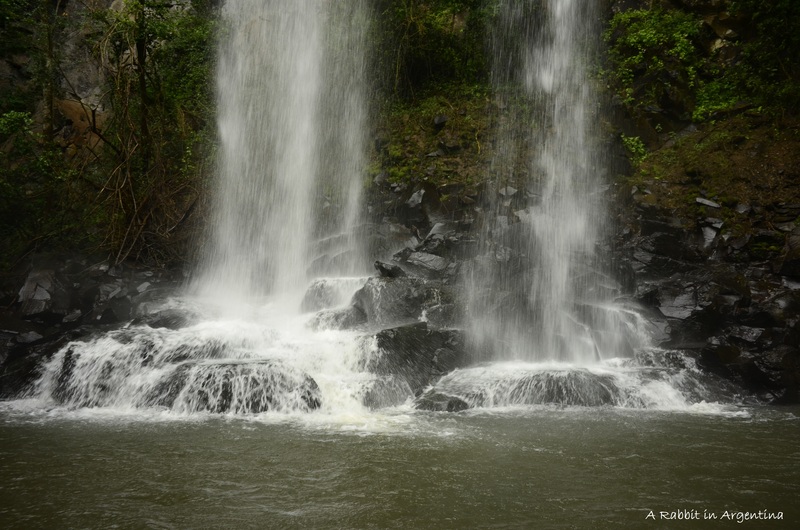 There are lots of side adventures run by private companies to partake in–zodiac boats, rock climbing, bike tours, white water rafting, ziplining–but the weather was starting to turn, and we didn’t feel like forking over $80 per person just to do a few little activities, most likely in the rain. 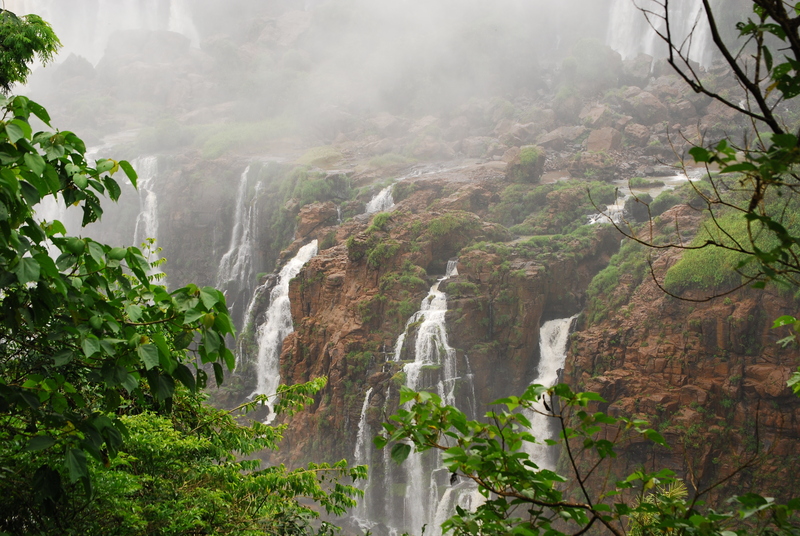 Ultimately, we made the right decision: it was drizzling when we made it back to our car, and full-on pouring buckets of water by the time we made it to the border. 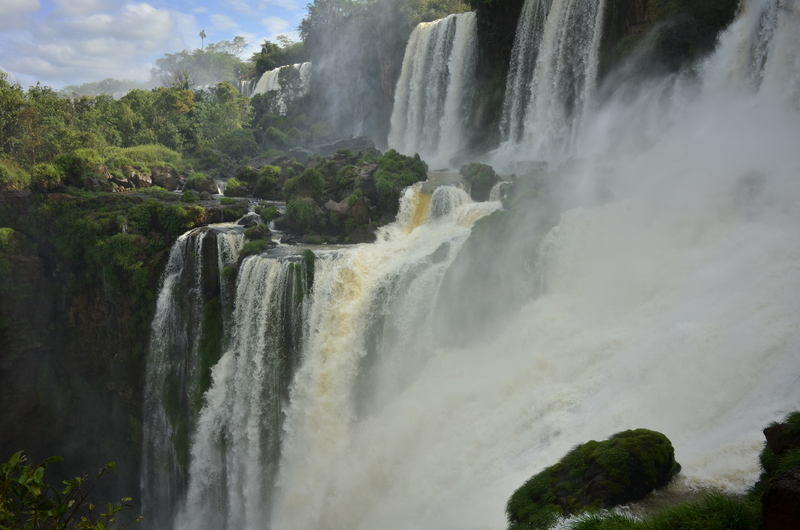 We’re planning on coming back to Iguazu again before we leave South America–so we figured leave some of the fun activities for the next time! 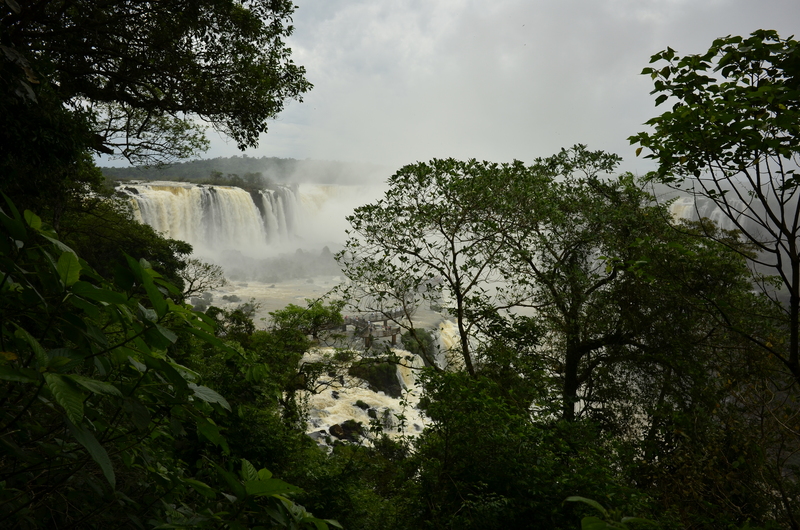 We didn’t hang out in the town of Foz de Iguacu much this time–but there are definitely some nice-looking hotels and resorts in the area, if you’re looking to stay on that side. We did briefly try to follow the signs for the tres fronteras marker in Brazil, but ended up in a not-so-nice neighborhood bordering on a favela, or shantytown, and decided to call it quits on that. 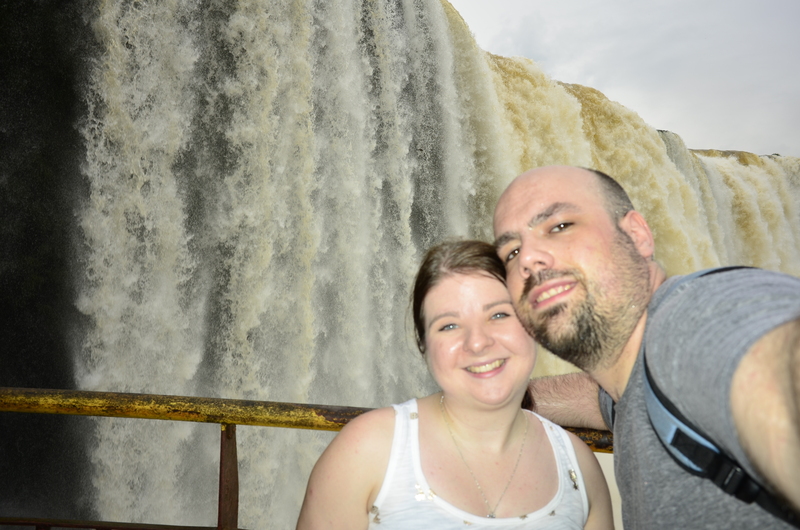 If you’re in Iguazu, definitely go to the Brazil side if you have the time and visa! It’s worth it to get the panoramic views and to see just how different two countries can be, just on the other side of the border. 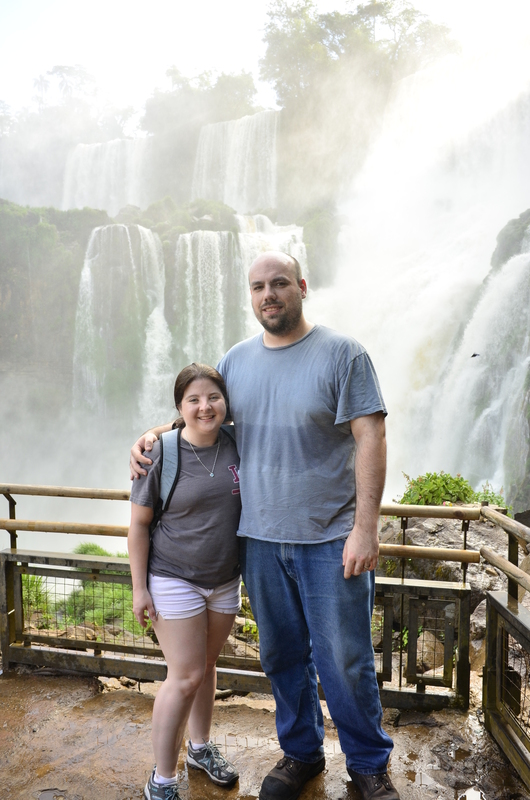 Since November 1st was our *real* anniversary (we got married in a courthouse before we got married in the “white dress and tux” sense), we decided to go to Bocamora in Puerto Iguazu for a celebratory dinner. Situated essentially on a cliff on the costanera, or coastline, it is an incredibly romantic location overlooking the Tres Fronteras area. 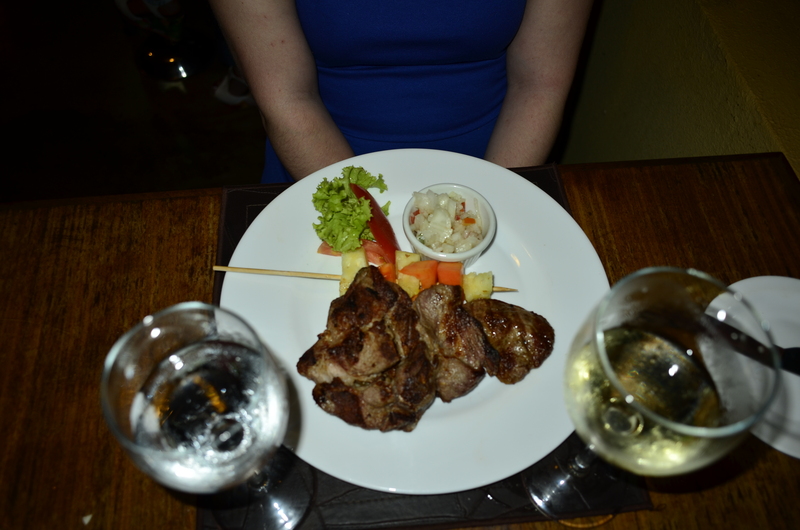 The menu was diverse, as was the wine list, the service was great, and the view was incomparable. We enjoyed a really nice meal on their back patio and toasted to two years! 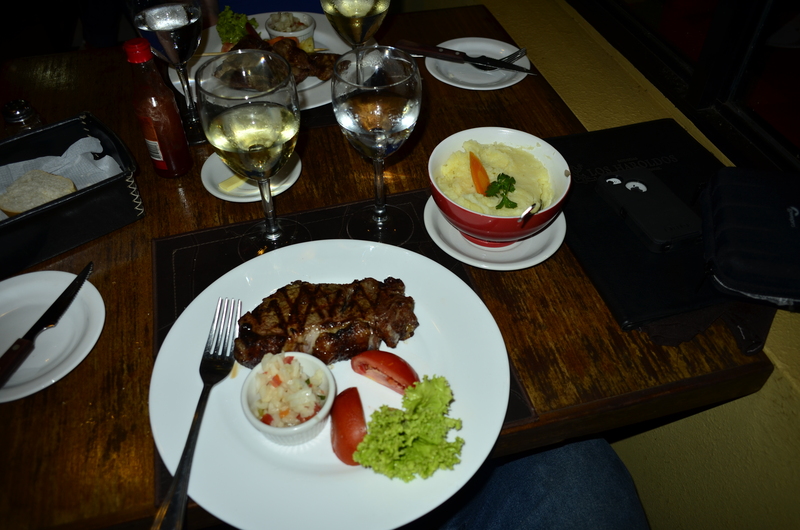 T got the ojo de bife (a very nice cut of meat), and I got a pork loin, both of which were delicious. We aren’t normally “that couple” who takes pictures of their food, but it looked pretty spectacular, so we couldn’t help ourselves. 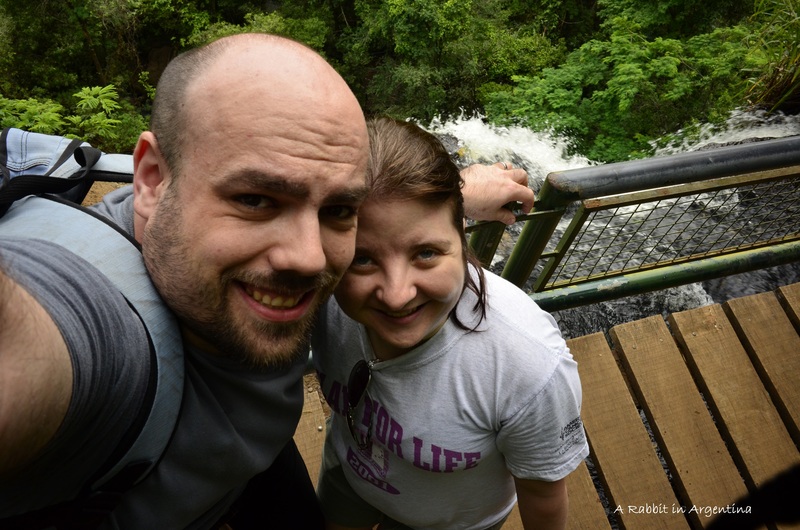 After our four hour drive from Ituzaingo to Iguazu, we settled into the Sheraton and decided to tackle a part of the lower trail. 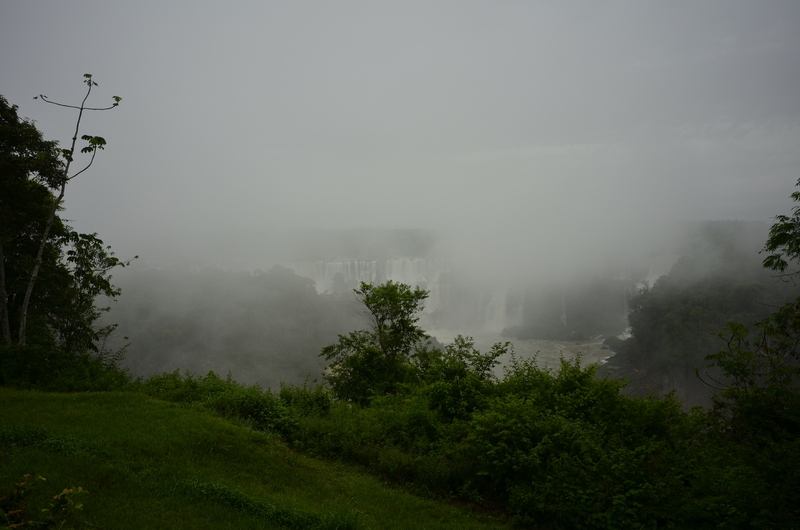 However, there was a fine but steady rain throughout the entire hike–so we didn’t get many usable pictures. 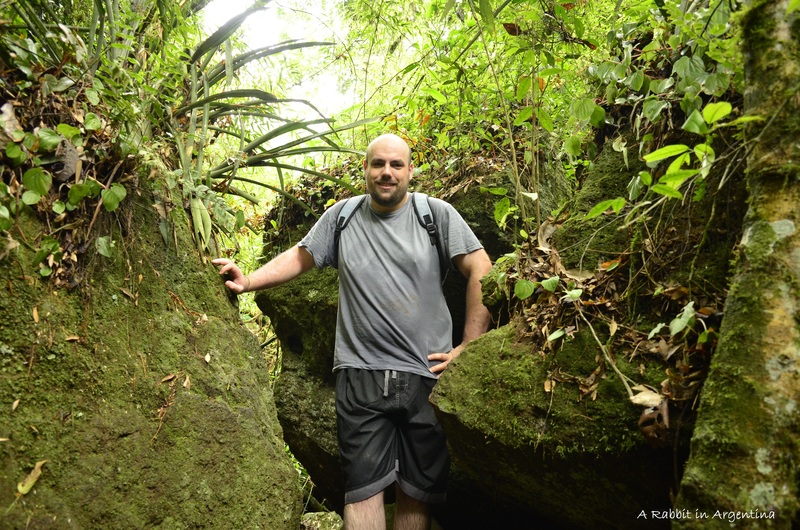 We decided to try it again on the second day, after the Sendero Macuco Trail. 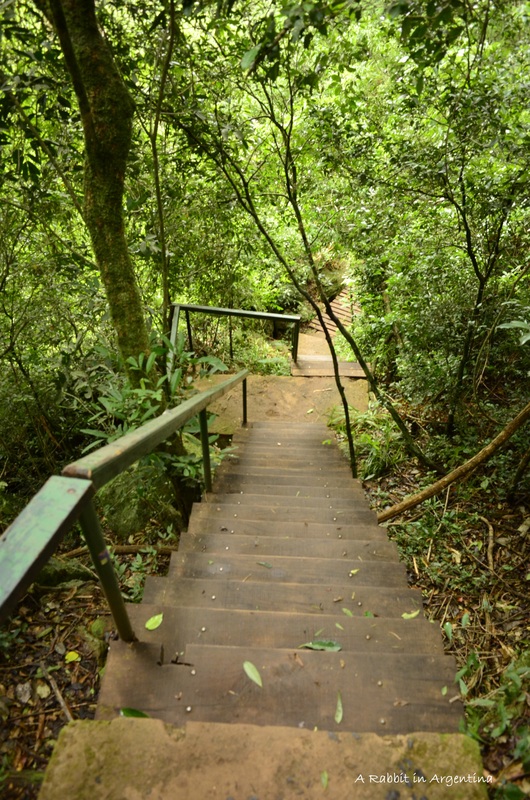 Argentina’s lower circuit is a nice hike, with well-kept wood-slat walkways and stairs. 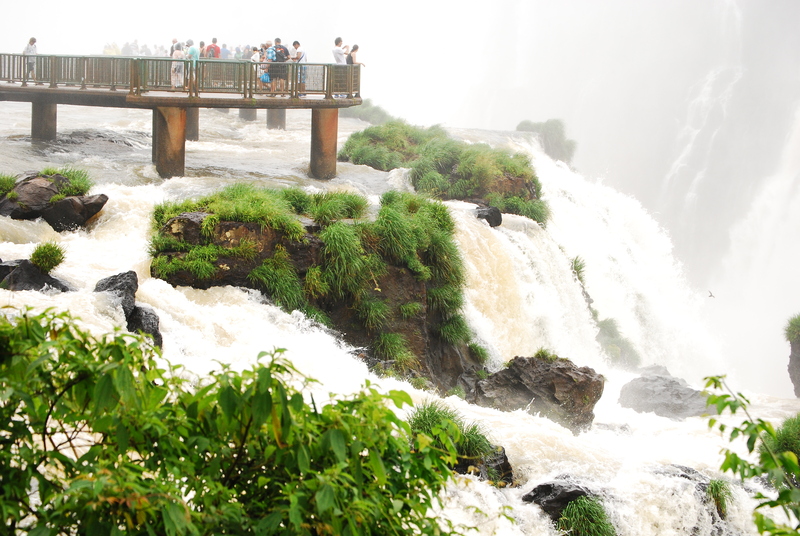 It offers fantastic opportunities to see the falls up close and personal–and we definitely got up close! 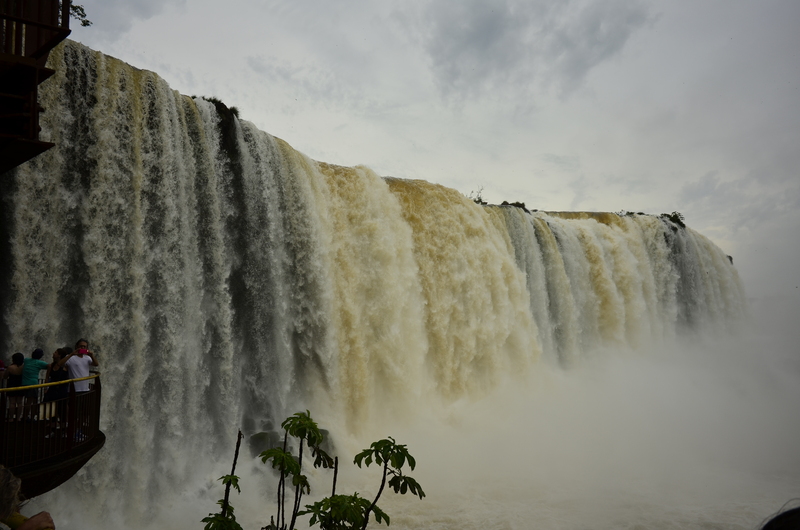 A lot of people asked us if we had the opportunity to see the Garganta del Diablo–Devil’s Throat. 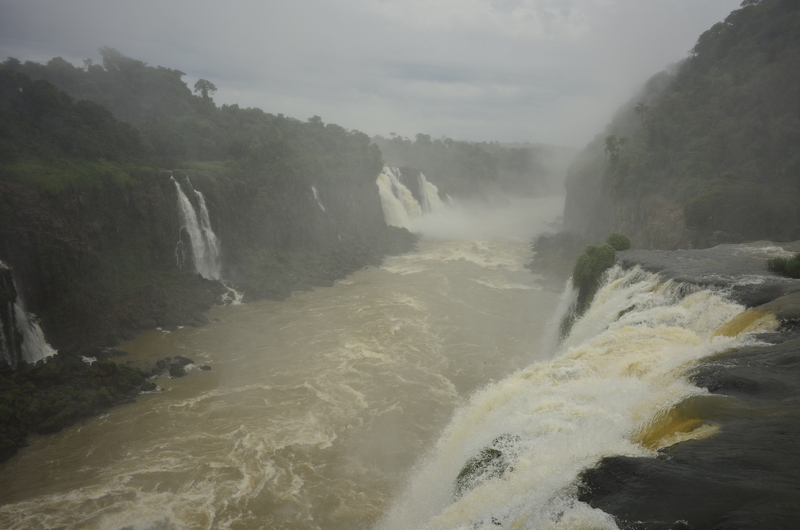 We didn’t–earlier in the year, there was some serious flooding in this area, and it wiped out the entire viewing trail for Garganta del Diablo. 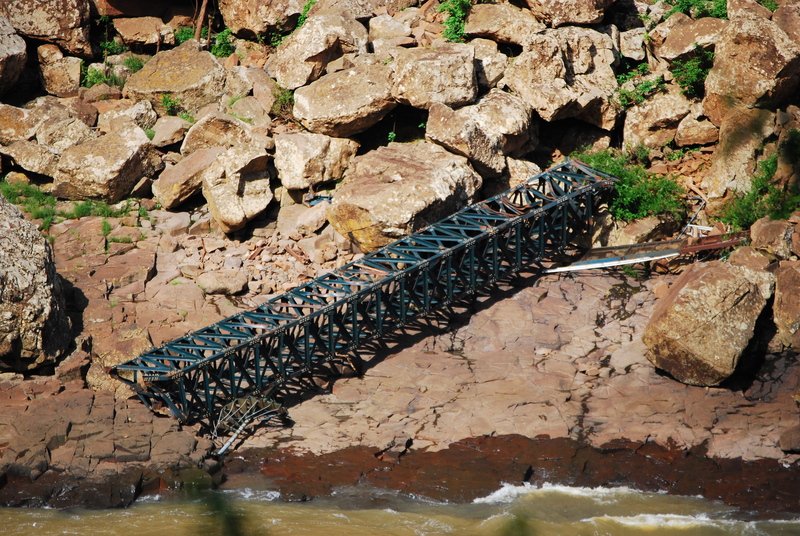 We did, however, see some of the wreckage on riverbanks while hiking. 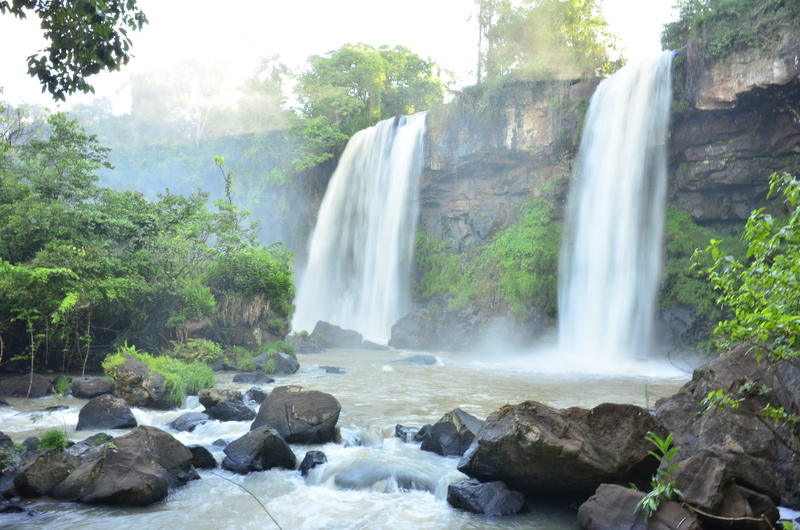 Also, due to high water levels, we couldn’t go to the island in the middle of the falls–Isla de San Martin. However–I don’t think we missed much! The views were fantastic, and several times we had to just stop and pinch ourselves that they were real. 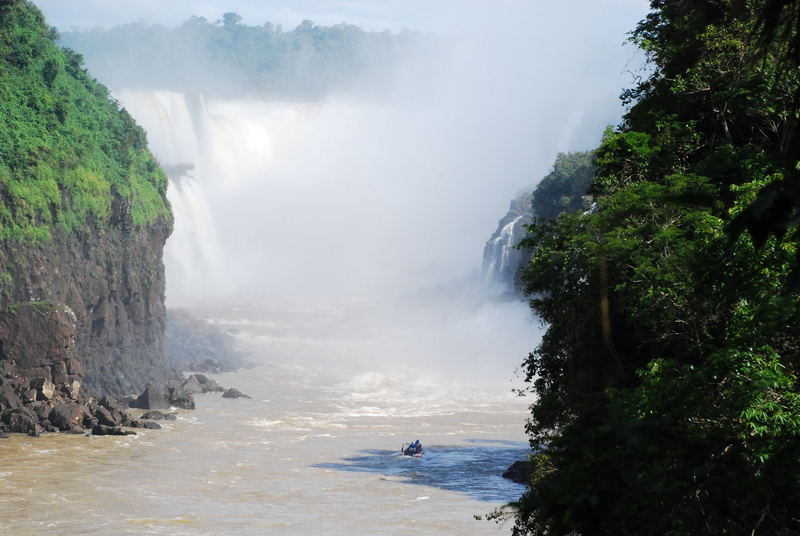 One thing that is a “don’t miss” activity on the Argentinian side is the Iguazu Jungle boat ride. 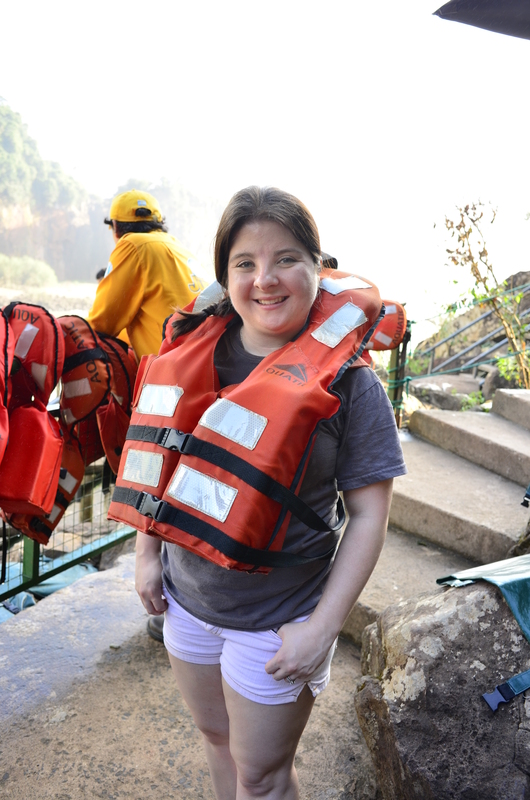 You strap into a life jacket, head onto a boat, put all of your belongings in a watertight bag, and then prepare to get wet. 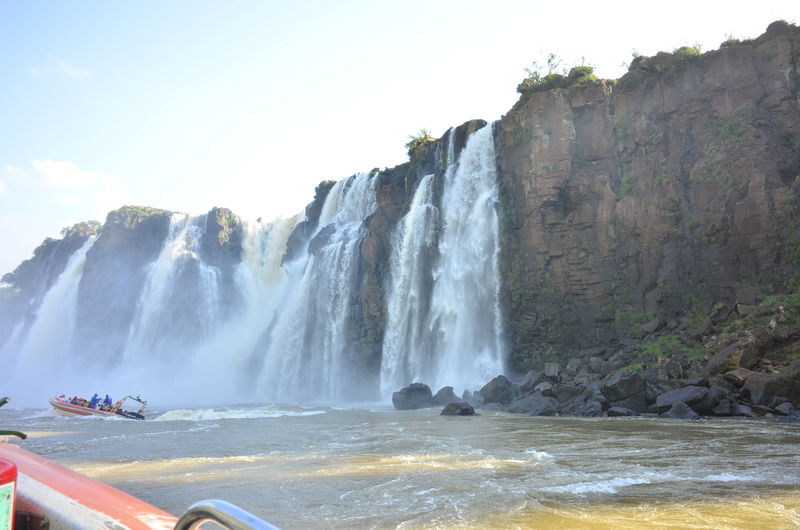 After a cruise to both sets of waterfalls for photo purposes, the boat takes you back around and absolutely drenches everyone by essentially parking underneath a waterfall. We’re glad we did this as our last activity on the trail! By the time we got off the boat, my sneakers were filled with water. Pro Tip: The Sheraton offers a drying only laundry service, and it’s 20% the cost of a normal laundry service. Unfortunately, they don’t do shoes. So bring several pairs if you’re planning on doing the boat ride. 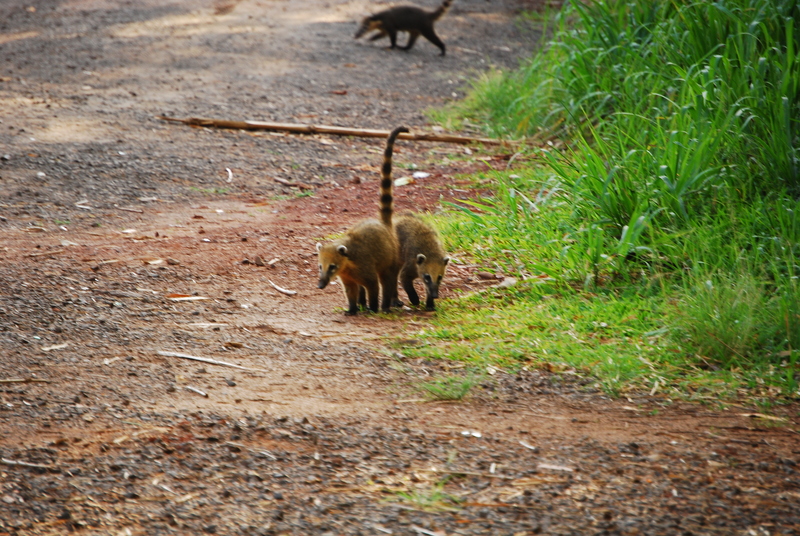 We also saw some fun animals along the way–lizards, birds, and of course, more coati. 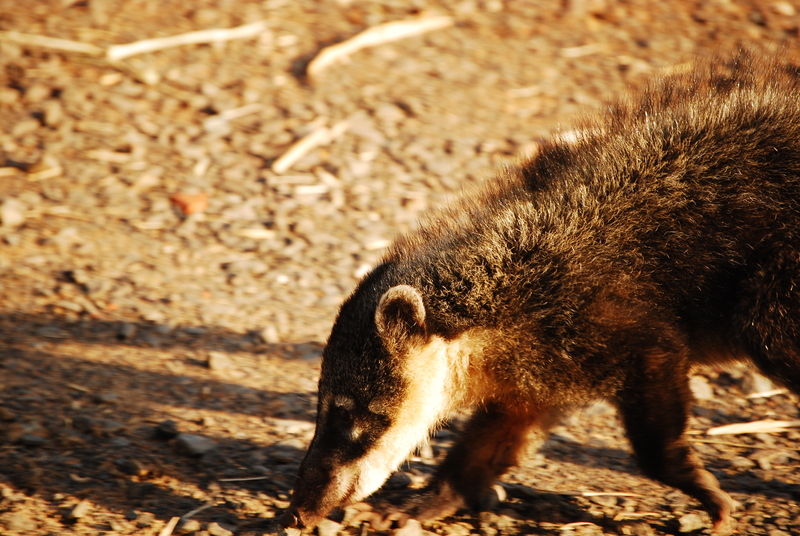 The coati aren’t afraid of humans at all, and in some cases will try to steal the food right out of your hand! 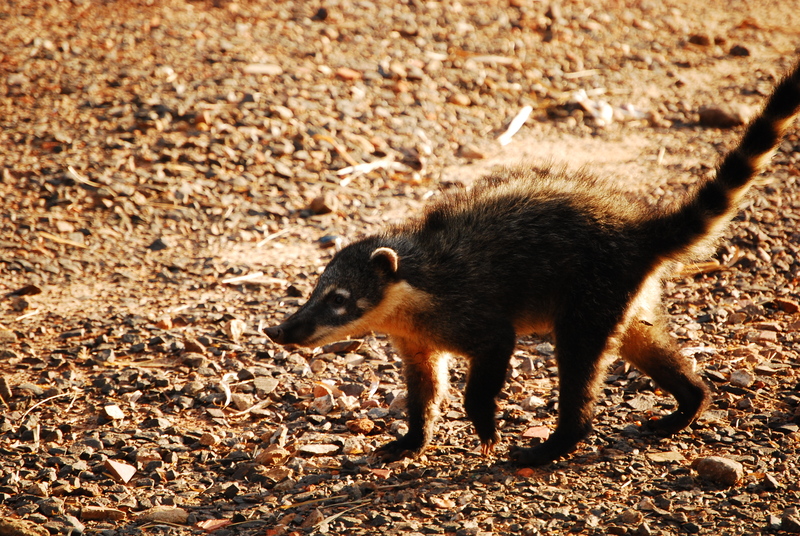 Don’t try to pet them, though–they are still wild animals, and there are some pretty graphic signs around the park showing what a coati can do to someone’s hand. 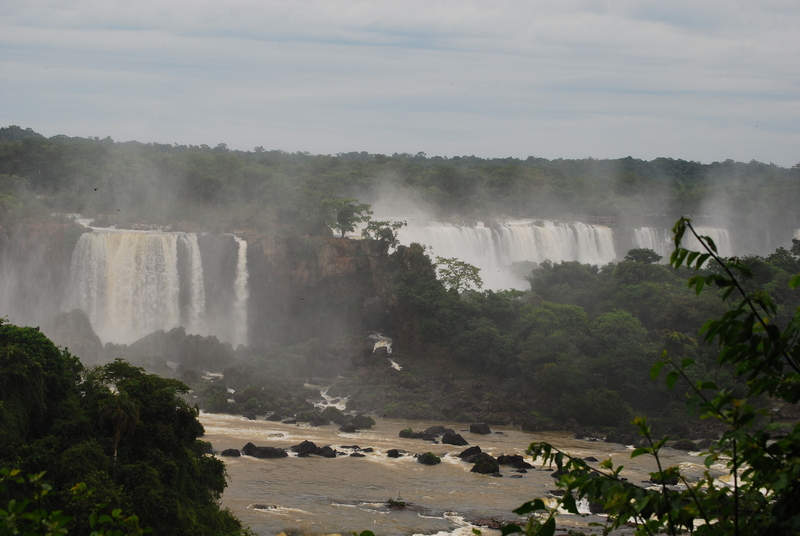 We decided to stay on the Argentinian side of the falls at the Sheraton. The advantage to the Sheraton is that it’s the only hotel inside the park, with rooms that overlook the falls (although they’re pretty expensive!). 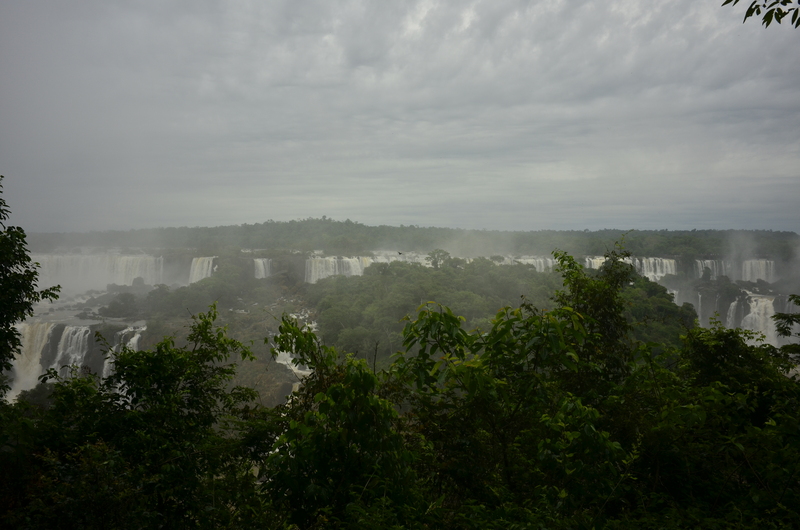 We opted for the less expensive jungle view room, which overlooked the forest. (In reality, it overlooked the driveway and parking structure, with the jungle in the near distance.) Overall, we highly recommend it–the rooms were all well-appointed, the restaurant was good, the breakfast buffet was the best we’ve had at a Sheraton in this country, and the staff was wonderful. 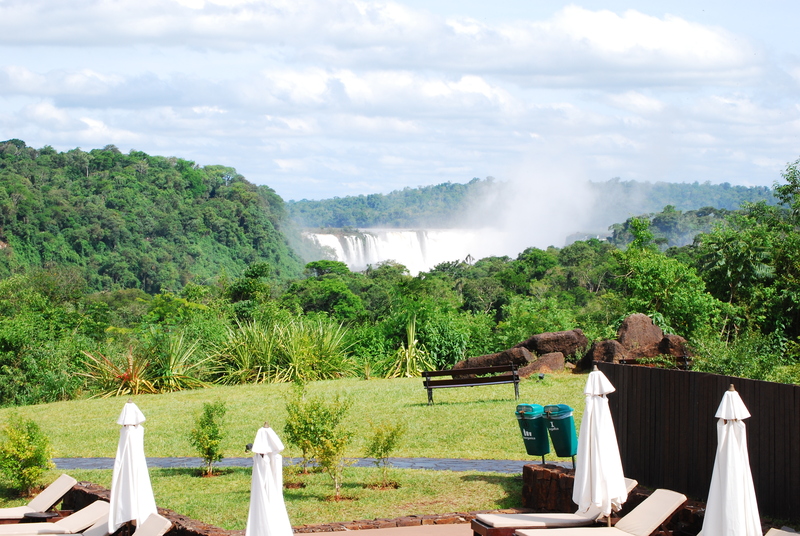 Also, add to that a really great pool area that overlooks the falls. While we were lounging by the pool and enjoying an (expertly made) pina colada, a few cuis, or guinea pigs, were running around! 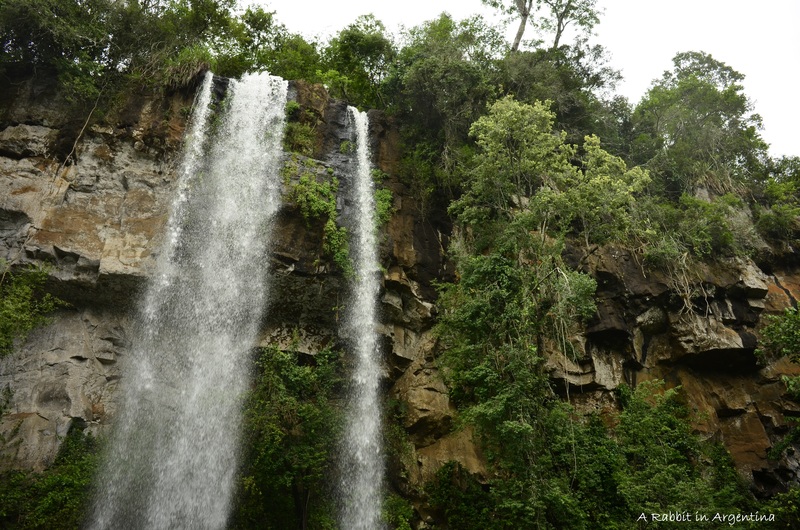 On our first full day at the falls, we decided to take the 3.75km long Sendero Macuco Trail all the way down to the Arrechea waterfall. 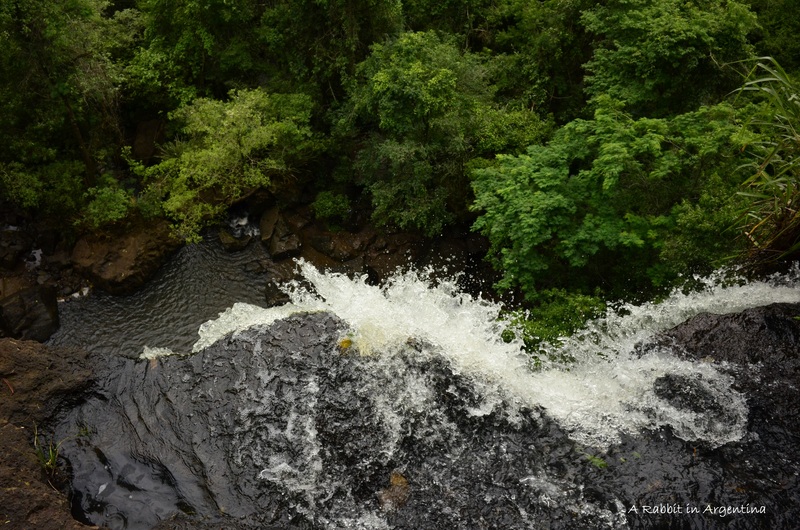 In all the tour guides, it mentioned that this trail had some of the best wildlife watching and hiking–and that you could swim in the waterfall at the end of the trail! Sold. We were the first ones on the trail in the morning. 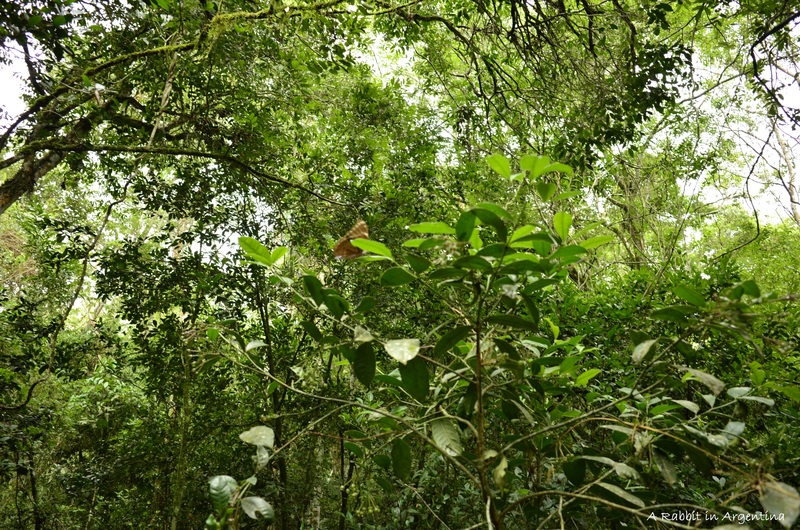 It was still cool and quiet, and we were surprised we didn’t see too many animals on the trail–just a few beautifully colored butterflies. 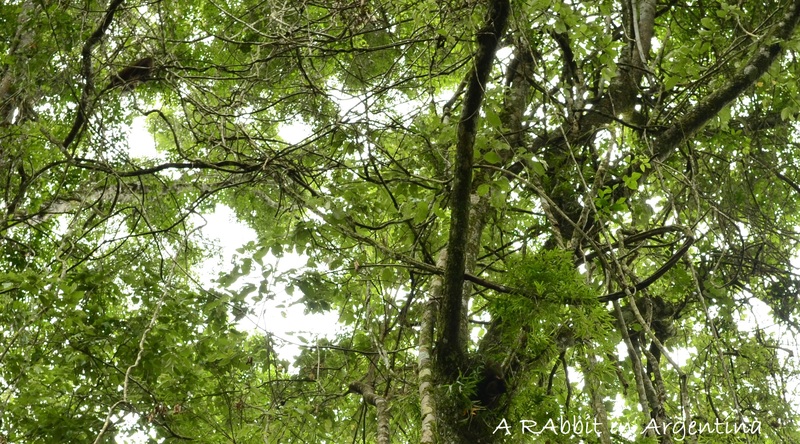 We could hear lots of birds in the trees, but didn’t have much luck spotting them. 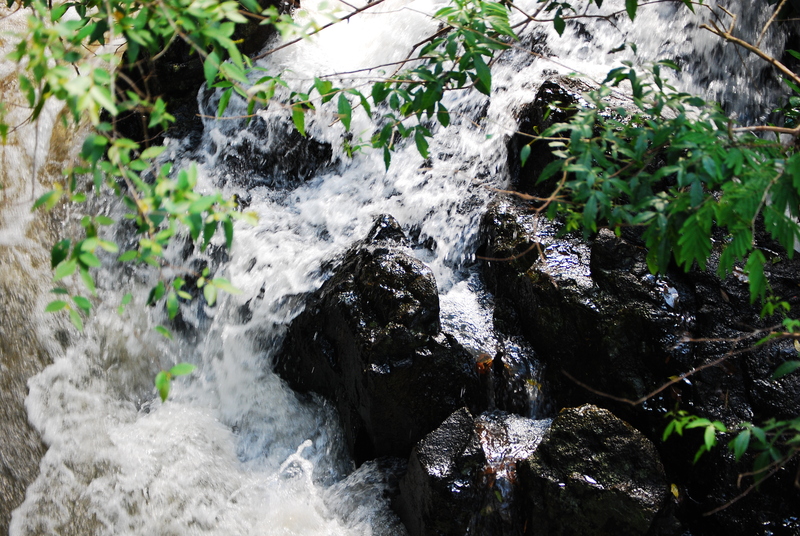 We did the overlook of the waterfall first. 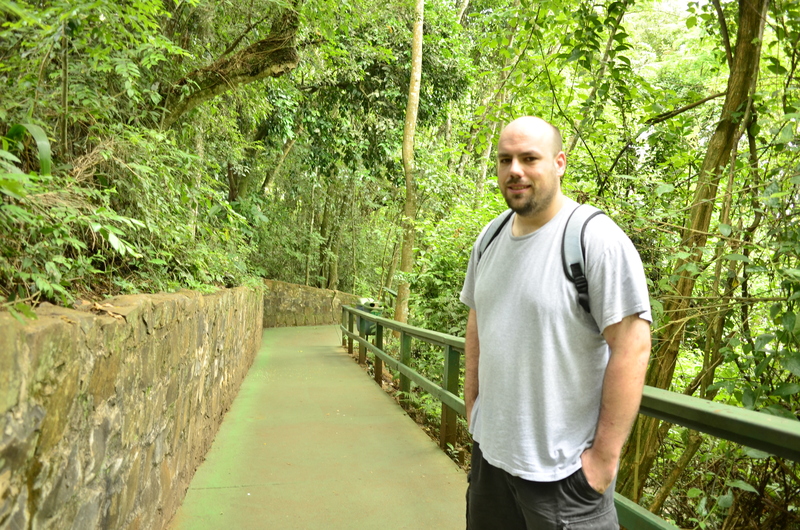 Then, we hoofed it down some very steep steps to the waterfall. We kicked off our sneakers and walked into the water. 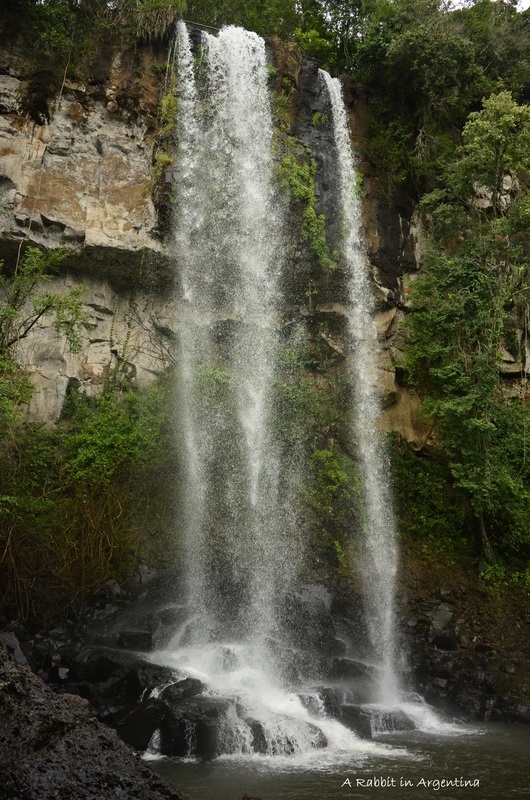 A bit cold at first, but it was totally worth it to be swimming in a pool directly underneath a waterfall! The mist got to be too much to get completely under the waterfall, but we got some great shots. 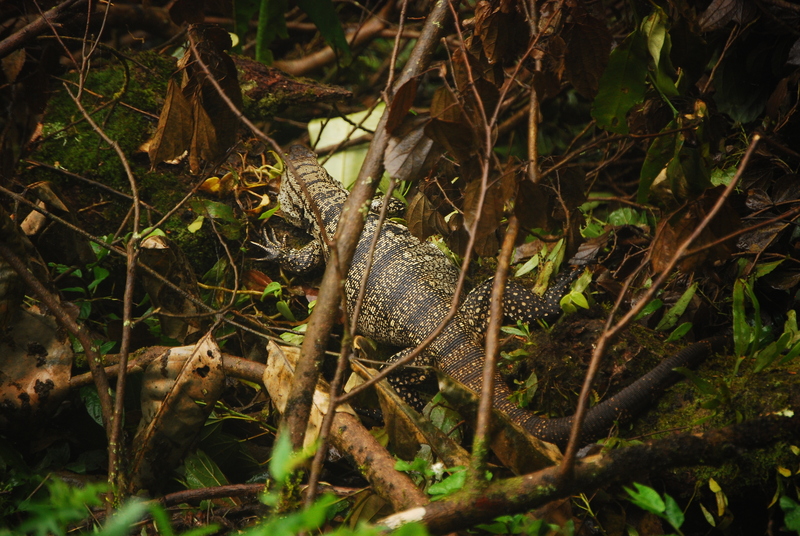 On our hike back, we saw lots more animals–and lots more hikers! 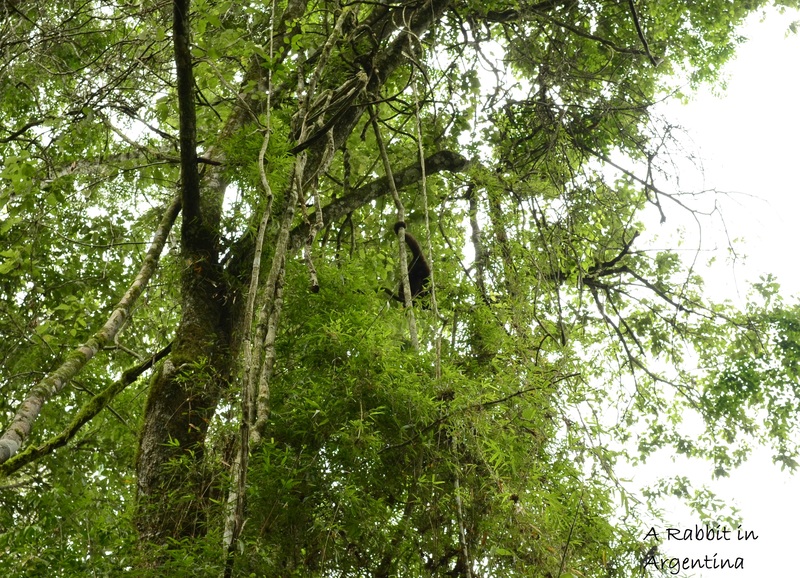 We encountered a whole troop of howler monkeys in the trees, and spent a good amount of time watching them swing around and find their breakfast. Very cool! 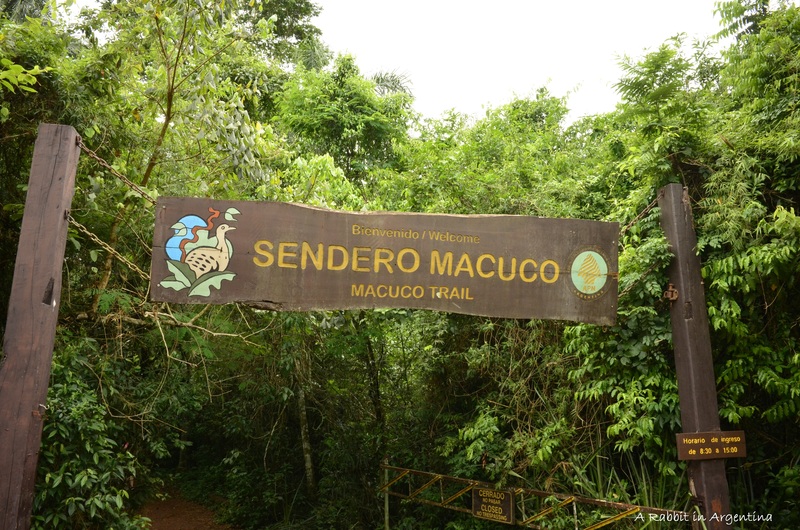 Our advice for conquering the Sendero Macuco Trail? Start early–it opens at 8:30am, and we were there right on time. 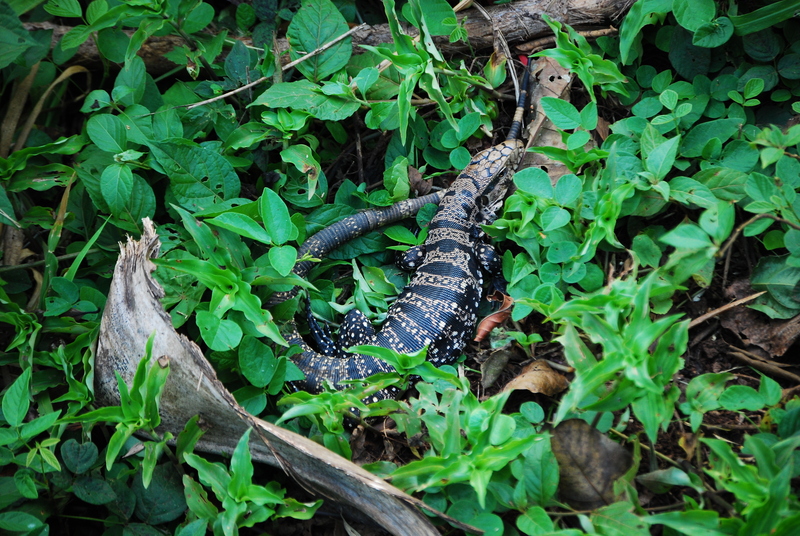 Be quiet when you walk–you’ll probably see more animals that way! 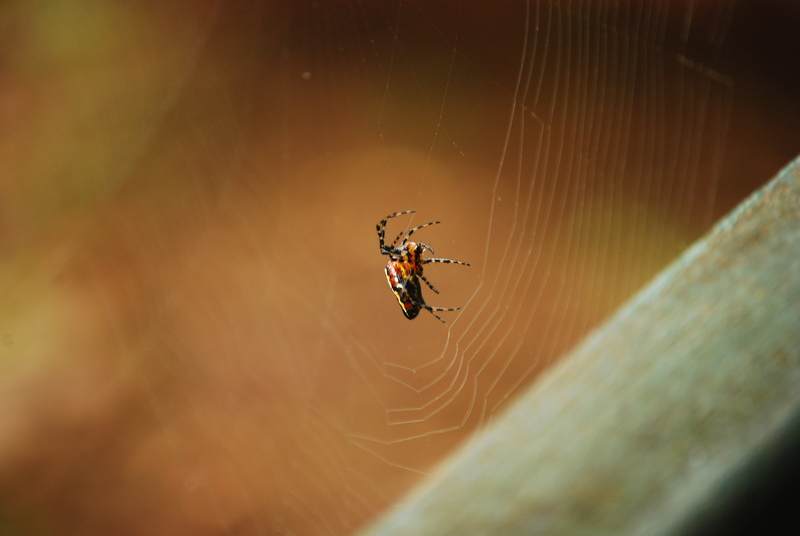 Bring bug spray–it’s pretty buggy out there, and over the weekend we got our fair share of mosquito bites despite generously applying Off! 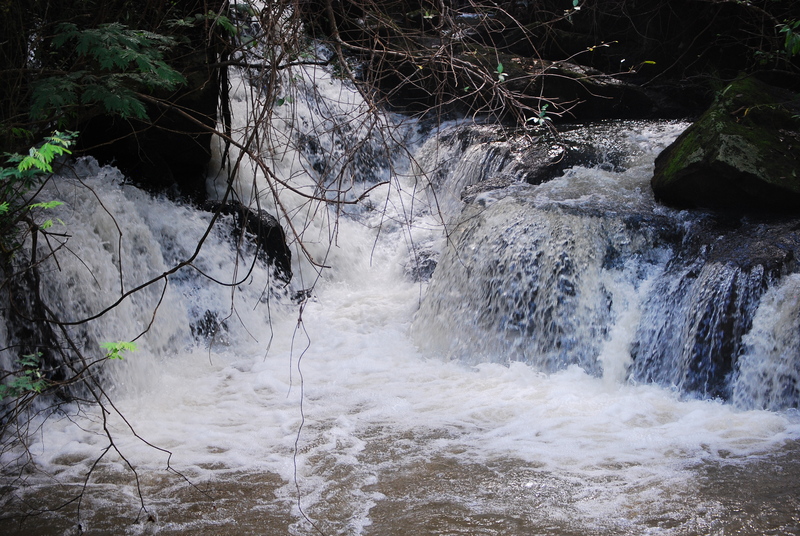 Also, it wouldn’t hurt to bring a pair of water shoes for the waterfall swimming. We did it barefoot, but some of the rocks were a little sharp, and we definitely would have felt better in some water shoes. While we’re on the subject–bring water!! It’s a long hike, there are a lot of stairs, and it’s HOT. Stay hydrated. 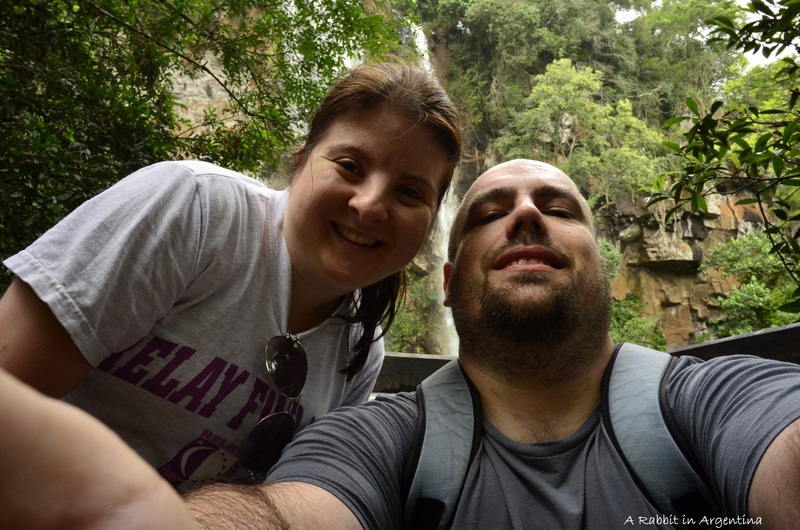 This was definitely one of the best portions of our little vacation–we can say we’ve swam underneath a South American waterfall now!